Cells in the inner ear called hair cells sense sound waves and head movements, allowing us to hear and maintain balance. In non-mammals such as birds and fish, the hair cells responsible for balance die and are replaced (in a process known as turnover) throughout life. However, it is largely assumed that no new balance hair cells are made in adult mammals such as humans and mice. This would mean that injured hair cells are never replaced, which could cause balance problems such as dizziness over time. There have been hints in past studies that perhaps some balance hair cells die or are newly made in adult mammals. Using a variety of new cell labeling and tracking methods in different types of mutant mice, Bucks et al. now show that the turnover of balance hair cells happens in adult mice under normal conditions. Both types of balance hair cells – known as type I and type II – are removed by supporting cells that surround the hair cells. In addition, the supporting cells can convert into new type II hair cells, but not type I hair cells, and type II hair cells do not convert into new type I hair cells. To compare these results with what happens after hair cell damage, Bucks et al. injected a toxin into mutant mice to kill most hair cells. This revealed that supporting cells make 6 times as many hair cells after severe damage than under normal conditions, but still only make type II hair cells. One important issue to study next is whether type I hair cells are ever created in adulthood. Many elderly people develop balance problems that lead to catastrophic falls. Perhaps one reason this occurs is because type I hair cells cannot be replaced in humans. In the adult mammalian nervous system, production of sensory and neural cells is limited to a few areas, including the hippocampus, the olfactory epithelium, and the olfactory bulb (reviewed in Beites et al., 2005; Ming and Song, 2005). When neurons die naturally in these areas, their debris is phagocytosed by microglia (reviewed in Fu et al., 2014). Different glial populations then divide and generate replacement neurons (Morshead et al., 1994; Doetsch et al., 1999; Johansson et al., 1999). In non-mammalian vertebrates, the mechanosensory receptors for balance, called vestibular hair cells (HCs), undergo turnover (cell death and replacement) throughout life. In the avian utricle, a vestibular organ sensing linear head movements, HCs die and are replaced at a slow rate in adulthood, maintaining cell numbers (Jørgensen and Mathiesen, 1988; Roberson et al., 1992; Kil et al., 1997; Goodyear et al., 1999). In mice, vestibular HC production is reported to occur only during gestation and the first two postnatal weeks (Ruben, 1967; Rüsch et al., 1998; Kirkegaard and Nyengaard, 2005; Burns et al., 2012). However, dying and immature-appearing HCs have been detected in utricles under normal conditions in adult guinea pigs (Forge et al., 1993; Li et al., 1995; Rubel et al., 1995; Lambert et al., 1997; Forge et al., 1998; Forge and Li, 2000) and bats (Kirkegaard and Jørgensen, 2000, 2001). The ability of adult rodents to regenerate small numbers of utricular HCs after ototoxin-induced damage is another indicator of plasticity in mammalian vestibular epithelia (Forge et al., 1993; Warchol et al., 1993; Forge et al., 1998; Kawamoto et al., 2009; Golub et al., 2012). Many tissues capable of regeneration after injury, such as integumentary, olfactory, and intestinal epithelia, also undergo cellular turnover under normal conditions (Taylor et al., 2000; Ito et al., 2005; Barker et al., 2007; Leung et al., 2007). Collectively, these studies suggest vestibular HC turnover may occur in adult mammals, but definitive evidence has not been presented. Supporting cells (SCs), which surround HCs, are epithelial cells that have properties of glia. Among their many functions (reviewed in Monzack and Cunningham, 2013; Wan et al., 2013), SCs serve as progenitors to new vestibular HCs during homeostasis in mature birds (Jørgensen and Mathiesen, 1988; Roberson et al., 1992; Kil et al., 1997) and after ototoxin-induced death of HCs in mature birds and mammals (Tsue et al., 1994; Lin et al., 2011). SCs also act as phagocytes after ototoxic damage, clearing cellular debris in birds (Bird et al., 2010) and mammals (Monzack et al., 2015). The capacity of SCs in adult mammals to phagocytose and renew vestibular HCs under normal conditions has not been explored. In this study, we demonstrate that a small, but significant proportion of HCs in utricles of adult mice are cleared and replaced by SCs in the absence of a damaging stimulus. There are two types of vestibular HCs, type I and type II, both of which are phagocytosed and removed from the sensory epithelium. However, fate-mapping indicates that SCs replace only type II HCs, and type II HCs do not convert into type I HCs, at least over the 8-month period of adulthood we examined. When HCs are killed by a toxin, SCs transdifferentiate into 6 times as many type II HCs compared to normal HC addition within the same 4-week period. This study demonstrates that the utricle is an additional neuroepithelium in mammals capable of generating sensory receptor cells throughout adulthood and defines the lineage of new HC production in this mature tissue under normal conditions and after HC damage in vivo. Utricles are otolithic vestibular organs located in the inner ear (Figure 1A). The utricular sensory epithelium (macula) is composed of an alternating array of SCs and two types of HCs (Figure 1B–D) and contains the processes of vestibular afferent and efferent nerves (reviewed in Eatock and Songer, 2011). Type I HCs have a flask-shaped body and a nucleus located at mid-epithelial depth, and they synapse onto large calyceal afferents. Type II HCs have complex shapes, with thick necks and basal cytoplasmic processes projecting from the cell body (Figure 1C,D; Pujol et al., 2014). Each type II HC nucleus is located near the lumenal surface. Type II HCs synapse onto small (bouton) afferents. SCs span the basal-to-apical extent of the epithelium, and their nuclei reside below HC nuclei, near the basal lamina. The utricle is divided into two zones: a C-shaped central region called the striola, in which specialized type I HCs are enriched, and the extrastriolar region, which surrounds the striola and occupies the remainder of the utricle (Figure 1B). Phagosomes target type I and type II HCs for clearance in adult mouse utricular maculae under normal conditions. (A) Schematic of the inner ear with the utricle highlighted in magenta. (B) Schematic of a surface view of a utricle (xy view) with HCs in magenta. Blue outlined region denotes the striola (S). The region surrounding the striola is the extrastriola (ES). Boxed area shown at higher magnification in C. (C) Higher magnification of schematic in B with slices through the level of type II HC nuclei (left panel) and the level of the SC nuclei (right panel). Nuclei in blue, HC perinuclear cytoplasm (left panel) and basolateral processes (right panel) in magenta, and SC cytoplasm in grey (xy view). (D) Schematic of a cross-section (xz view) of the adult mouse utricle. II, type II HCs; I, type I HCs. Double lines indicate positions of the xy views shown in C, with the upper set of lines referring the left panel in C, and the lower set of lines referring to the right panel in C. The bracket indicates the level of the SC nuclei, the focal plane of xy confocal optical images in E–E’’’, H–J, K’–K’’. In panels E–K”, F-actin was labeled with phalloidin (green) and HCs were labeled with anti-myosin VIIa antibodies (Myo, magenta), except there is no myosin label in panel J. In E–E’”, blue label is DAPI. In H–K”, each blue label is a different cell-selective marker. (E–E’’’) Confocal xy optical sections of the SC nuclear layer in an adult Swiss Webster utricle. (E) Two ectopic HCs (arrowheads) are located next to F-actin-rich phagosomes (arrows). Inset, a ring-shaped phagosome not associated with a HC. See Video 1 for a 3D reconstruction of a phagosome targeting a HC, and see Video 2 for all xy images in the z-series of E. Myosin-labeled HC cytoplasm that is not surrounding a nucleus corresponds to type II HC basolateral processes (see 1C, right panel). (E’–E”’) Higher magnification of the two HCs indicated by arrowheads in E. Arrowheads in E” point to the nucleus of each ectopic HC. (F) Transverse section of an adult Swiss Webster mouse utricle showing an ectopic HC (black arrow) located in the SC nuclear layer that has condensed chromatin. The ectopic cell is surrounded by a calyx (black arrowhead), typical of a type I HC. The calyx appears as an electron-lucent ring around the cell, which has minimal cytoplasm and contains numerous electron-dense mitochondria (small gray dots). A calyx surrounding a normally localized type I HC (I) is indicated by the white arrow. Several normally positioned type I and II HCs are indicated (I, II over nucleus). Inset, higher magnification of the ectopic type I HC. (G) Several HCs and F-actin-rich phagosomes are shown in this projection image of a Swiss Webster macula. Two F-actin spikes are indicated by arrowheads. White circles indicate the area of 3 type II HCs for reference. (H–K’’) Phagosomes co-localized with markers of type I or II HCs in xy confocal slices at the level of SC nuclei in Swiss Webster utricles. (H) Two ectopic HCs (arrowheads) have POU4F3-positive nuclei (blue) and are connected to a large ring-shaped phagosome. (I) Two ectopic HCs associated with a basket-like phagosome. One HC has a SOX2-negative nucleus (arrow, lacking blue label), and the other HC has a SOX2-positive nucleus (arrowhead, blue). (J) Three ectopic HCs (arrowheads) associated with phagosomes are calretinin-positive (blue). Arrow indicates an example of a F-actin spike. (K) Tenascin (Ten, blue) immunolabeling in normally localized HCs (arrowhead). (K’,K”) Tenascin labeling (blue) is evident in two ectopic HCs (arrowheads) co-localized with phagosomes (green). Scale bar shown in E is 10 μm for E, 7 µm for E’–F, 3.5 µm for F inset, and 14 µm for G. Scale bar shown in H is 5 µm for H–K’’. To address if vestibular HCs undergo turnover in normal adult mice, we sought evidence for programmed cell death in whole-mounted utricles utilizing terminal deoxynucleotidyl transferase dUTP nick end labeling (TUNEL) and immunolabeling for activated caspase-3 (aCasp3). Although we detected cells with TUNEL or aCasp3 immunolabeling in connective tissue below the macula and in intestinal epithelia labeled simultaneously with utricles, we detected no labeled cells in normal maculae using either method (data not shown). We reasoned that HC removal may occur too infrequently to capture cell death, so we looked for other evidence. When SCs clear HCs after ototoxin-mediated injury, they first produce an actin cable to constrict the HC and extrude its most apical portion, including the stereocilia bundle (Meiteles and Raphael, 1994; Li et al., 1995; Bird et al., 2010; Monzack et al., 2015). Then, one or more SCs form actin-rich phagosomes that engulf the remaining HC body. Actin filaments comprising the phagosome are interlaced around each HC as it is consumed, and the phagosome structure appears basket- or ring-like (Bird et al., 2010; Monzack et al., 2015). To determine if utricular SCs consume HCs under normal conditions in adult mice, we labeled utricles from 5- to 10-week-old Swiss Webster mice with phalloidin, which binds filamentous actin (F-actin). 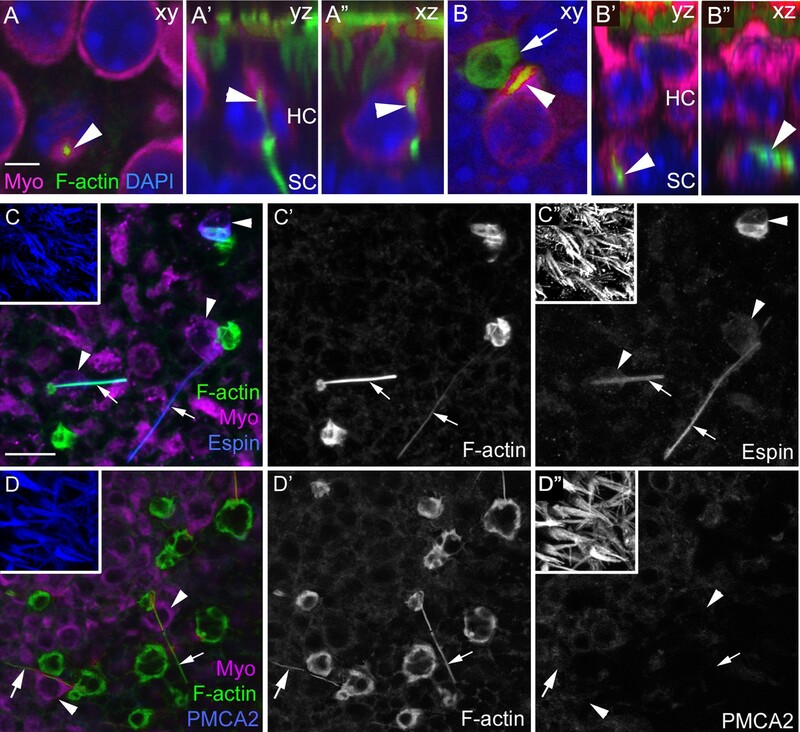 In whole-mounted normal utricles, we detected numerous F-actin-rich structures that were basket-like or ring-shaped (Figure 1E–E”’,G–K”, Video 1), resembling phagosomes described before (Bird et al., 2010; Monzack et al., 2015). The vast majority of these structures was restricted to the basal compartment of the epithelium, amongst SC nuclei. We counted 48.9 ± 14.8 (mean ± standard deviation) phagosomes per utricle (n = 8; Figure 3A; Figure 3—source data 1). Immunolabeling of myosin VIIa, a HC-specific marker (Hasson et al., 1995), revealed that 21.7% ± 16.1% of phagosomes per utricle were clearly associated with HCs whose cell bodies had been translocated basally to the SC nuclear layer and were therefore considered ectopic (95% confidence interval: 8.8–34.6%; n = 6; Figure 1E–E”’,H–K”; Video 2). There were two primary types of associations between phagosomes and ectopic HCs. In 55.2% (±9.7%; 95% confidence interval: 47.5–63.0%; n = 6) of associations, phagosomes were composed of a ring-like structure that fully encircled a HC body (Figure 1E–E’”, arrowheads) and were connected to a basket-like structure devoid of HC material (Figure 1E–E’”, arrows). Most other phagosomes associated with ectopic HCs consisted of a basket-like structure with one or more F-actin-rich processes that extended laterally and either contacted nearby HCs (Figure 1G) or pierced and entered their cytoplasm (Figure 1H,J,K”, Video 1). In Swiss Webster mice, we counted 12 ± 9.9 ectopic HCs per utricle that were associated with phagosomes (95% confidence interval: 4.3–20.1; n = 6). However, the majority of phagosomes (71.7% ± 14.3%; 95% confidence interval: 60.3–83.1%; n = 6) lacked HC staining within or around them (Figure 1E inset), suggesting they may be clearing other cell types or being retracted after completion of HC digestion. 3D reconstruction of a phagosome in an adult Swiss Webster utricle under normal conditions. This movie is a y-axis rotation of a 3D reconstruction of an ectopic HC (myosin VIIa, magenta) associated with a F-actin phagosome (phalloidin, green). The phagosome consists of a large basket-like structure with a spike, or process, that extends through the cytoplasm of the HC along its nucleus. Note the basket-like structure is not solid F-actin but has gaps that lack labeling suggestive of a lattice. All nuclei are labeled with DAPI (blue). Phagosomes in the SC nuclear layer of an adult Swiss Webster utricle under normal conditions. This movie was constructed from optical sections collected from the area shown in Figure 1E. It begins at the level of type II HC nuclei and progresses through type I HC and SC nuclei, ending at the basal lamina. All nuclei are labeled with DAPI (blue), HCs are labeled with myosin VIIa antibodies (magenta), and the F-actin in phagosome basket- and ring-like structures and spikes (or processes) is labeled with phalloidin (green). Examination of serial transverse sections of a utricle from an adult Swiss Webster mouse confirmed that some HCs were located in a basal, ectopic position (Figure 1F). Of 6 such cells we observed in the sectioned utricle, one HC appeared to have condensed chromatin characteristic of apoptosis (Figure 1F). Although we examined hundreds of ectopic HCs in utricles, no other HCs had obvious abnormalities or signs of apoptosis other than their location. Indeed, 4',6-diamidino-2-phenylindole (DAPI) labeling revealed no variation in nuclear size, integrity, or density of chromatin in ectopically located HCs or HCs associated with phagosomes (Figure 1E”). To examine the type of HCs targeted by phagosomes, we labeled utricles with phalloidin and antibodies to other HC markers (Figure 1H–K”). The nuclei of basally translocated cells being engulfed by phagosomes were immunoreactive for antibodies against POU4F3 (Figure 1H), a HC-specific transcription factor (Erkman et al., 1996; Xiang et al., 1997), confirming their identity. We found evidence that both type I and type II HCs were being targeted by phagosomes. SOX2 is a transcription factor that is abundant in SCs and type II HCs, but is not found in type I HCs (Oesterle et al., 2008). Some phagosomes were associated with a myosin VIIa-positive cell whose nucleus was SOX2-positive (Figure 1I). In other utricles, we found phagosome-associated HCs that were immunoreactive for the calcium-binding protein, calretinin (Figure 1J), which is selectively elevated in type II HCs (Desai et al., 2005). Some phagosomes engulfed cells that were immunoreactive for tenascin (Figure 1K–K”), an extracellular matrix protein that lines the space between the type I HC plasma membrane and the afferent calyx (Swartz and Santi, 1999). Further, one ectopic HC in transverse plastic sections was wrapped by a calyceal afferent (Figure 1F), identifiable by its electron-lucent appearance except for scattered mitochondria, which is typical of a type I HC. To address the mechanism of HC clearance, we examined phalloidin labeling in HCs located in their proper positions. We estimate that 2–10 normal-appearing HCs per utricle contained a long ‘spike’ of F-actin that coursed through the cytoplasm. Typically, the spike extended from the cell’s apex to its base, then exited the cell and descended toward the basal lamina (Figure 2A–A”, Video 3). It is notable that we detected a similar spike-like structure in the cytoplasm of 5.3 (±4.3; 95% confidence interval: 2.0–8.7; n = 6) basally translocated HCs per utricle that were associated with phagosomes (Figure 2B–B”, and Figure 1H,J,K”). Some actin spikes extended laterally outside the HCs for several cell widths (Figure 1G), and some spikes were not clearly associated with any HCs. F-actin spikes are present in HCs, and the HC bundle is likely ejected prior to HC body translocation under normal conditions. (A–A”) A F-actin spike (green, arrowhead) in a normally localized HC [myosin VIIa (Myo) magenta] from a C57Bl/6J mouse is shown in 3 views. (A) is a xy optical section at the level of type II HC nuclei (DAPI, blue). (A’,A”) are yz and xz optical (cross) sections of the HC indicated in A by the arrowhead. Note the F-actin spike is beneath the apical surface, which is highlighted by the row of brightly labeled stereocilia (green) at the top of A’ and A”. See Video 3 for all xy images in the z-series of A. HC, HC nuclear layer; SC, SC nuclear layer. (B–B”) A F-actin spike (green, arrowhead) in an ectopic HC (Myo, magenta) from a C57Bl/6J mouse is shown in 3 views. (B) is a xy optical section at the level of SC nuclei (DAPI, blue). (B’,B”) are yz and xz optical sections of the HC shown in B. Arrow points to a basket-like phagosome. (C–D’’) Confocal optical sections from two normal Swiss Webster mouse utricles labeled with F-actin, antibodies to myosin VIIa, and with either anti-espin antibodies (C–C”) or anti-PMCA2 antibodies (D–D”). The 3 panels for each utricle (C–C” or D-D”) show different label combinations for the same field, as indicated. All panels are focused on the SC layer, except the boxed insets, which are focused on stereocilia. Arrowheads in C,D and C”,D” point to ectopic HCs (Myo, magenta in C and D), while arrows in all panels point to F-actin spikes (green in C,D and white in C’,D’). Scale bar in A is 3 µm and applies to A–B”. Scale bar in C is 10 µm and applies to C–D”, including insets. F-actin spike through a normally located HC in an adult mouse utricle under normal conditions. This movie was constructed from optical sections collected from the area shown in Figure 2A–A’’. The movie begins above the stereocilia bundles (F-actin, green), continues through the type II and type I HC nuclear layers (DAPI, blue), and ends in the SC nuclear layer. A myosin VIIa labeled HC (magenta), which has a normal-appearing stereocilia bundle (below the arrow), has a F-actin spike (green, arrow) within its cytoplasm, extending the length of the HC and into the SC nuclear layer. During phagocytosis after HC damage by aminoglycosides, the apical portion of the HC is cleaved and ejected apically (Meiteles and Raphael, 1994; Li et al., 1995; Bird et al., 2010; Monzack et al., 2015). To determine if this also occurs under normal conditions, we labeled utricles with antibodies to espin and plasma membrane calcium ATPase 2 (PMCA2), which are reported to label stereocilia, but not other structures in the sensory epithelium (Dumont et al., 2001; Li et al., 2004). As anticipated, stereocilia were brightly labeled with both antibodies (Figure 2C,D insets). Occasional ectopic HCs were diffusely labeled by either antibody (Figure 2C,C”, espin labeling), but none of them contained brightly labeled foci resembling stereocilia (Figure 2C–D”). Thus, our observations suggest that the apical part of the HC is ejected apically prior to translocation or that stereocilia degenerate during translocation. Interestingly, espin antibodies labeled most actin-rich spikes (Figure 2C–C”). Initially, we thought this could indicate that spikes are derived from stereocilia. However, spikes were not labeled for antibodies to PMCA2 (Figure 2D–D”), suggesting this is not the case. Perhaps espin serves as an actin-bundling protein in phagosome spikes, as it does in stereocilia (Zheng et al., 2000). In 5- to 10-week-old Swiss Webster mice, there were 48.9 (±14.8) phalloidin-labeled phagosomes per utricle (Figure 3A, Figure 3—source data 1), displaying a range of morphologies. To assess if phagosomes are unique to Swiss Webster mice at 5–10 weeks of age, we analyzed Swiss Webster utricles at 3 weeks and 43–46 weeks of age, as well as utricles from two strains of inbred mice (C57Bl/6J and CBA/CaJ) at all 3 ages (Figure 3A, Figure 3—source 1). The distribution of phagosomes in the utricular macula was similar across utricles and ages: phagosomes appeared to be concentrated in the peristriolar region (Figure 3B,B’). The morphologies of phagosomes were also similar in all 3 strains of mice (not shown). However, C57Bl/6J and CBA/CaJ utricles consistently had fewer phagosomes than Swiss Webster utricles (Figure 3A, Figure 3—source data 1). Within each strain, the number of phagosomes was similar at all ages examined (Figure 3A, Figure 3—source data 1). These findings demonstrate that HC clearance occurs under normal conditions in different strains of mice at a range of ages. Phagosomes are present in several mouse strains across ages. (A) Number of phagosomes per utricle in 3 mouse strains (CBA/CaJ, C57Bl/6J, and Swiss Webster) at 3 weeks, 5–10 weeks, and 43–46 weeks of age. Data are presented as mean ± 1 standard deviation for n = 3–8 mice per group (see Figure 3—source data 1). Within each strain, the number of phagosomes did not increase significantly over time. CBA/CaJ and C57Bl/6J mice had similar phagosome numbers (10–15 per utricle), but Swiss Webster mice had significantly more phagosomes per utricle (45–65) than the other strains at every age, as determined by two-way ANOVA (p=0.0189 for age and p<0.0001 for strain followed by Bonferroni’s multiple comparisons test; ****p<0.0001). (B,B’) Confocal projection image of the utricular macula from an adult Swiss Webster mouse showing that F-actin-rich phagosomes (green) are concentrated in the peristriolar region of the extrastriola (ES) but are largely absent from the calbindin-labeled striola (S, blue) and the peripheral-most portion of the ES. The projection image was constructed from just beneath the stereocilia through the SC layer to avoid obstruction of the phagosomes by the F-actin-rich stereocilia. Scale bar is 100 μm. Arrowheads in B,B’ point to a portion of the utricular macula that sustained damage during dissection; this region is rich in F-actin but is not a phagosome. We examined whether phagosomes derive from SCs or from cells in the macrophage/monocyte lineage. First, we fluorescently labeled the cytoplasm of SCs to assess if they generate actin-rich phagosomes using Plp1-CreERT2 mice, which have been used previously to label SCs in mouse utricles (Gómez-Casati et al., 2010; Burns et al., 2012; Wang et al., 2015). In 6-week-old Plp1-CreERT2:ROSA26CAG-loxP-stop-loxP-tdTomato mice (hereafter referred to as Plp1-CreERT2:ROSA26tdTomato mice), the majority of SCs were tdTomato-positive at one week after injection of tamoxifen (Figure 4B). A small number of cells in the transitional epithelium, which borders the sensory epithelium (Figure 4B), and numerous cells in the stroma (presumed Schwann cells, not shown) were also tdTomato-positive. We sampled 8 regions of the macula and determined that 91.7% (±6.1%; n = 3) and 68.4% (±1.8%; n = 3) of SCs in the extrastiola and the striola, respectively, were tdTomato-positive (Figure 4—source data 1). In age-matched Plp1-CreERT2:ROSA26tdTomato mice that did not receive tamoxifen, <5% of SCs per utricle (126.8 ± 46.8; 95% confidence interval: 80.9–172.6; n = 4) were tdTomato-positive (Figure 4A), revealing some tamoxifen-independent Cre activity. We labeled Plp1-CreERT2:ROSA26tdTomato utricles collected at one week post tamoxifen with phalloidin to visualize phagosomes and antibodies against myosin VIIa to visualize HCs. We detected an average of 27.8 (±4.3; 95% confidence interval: 23.0–32.6; n = 3) phagosomes per utricle, which were fewer than Swiss Webster mice, but more than CBA/CaJ and C57Bl/6J mice (Figure 3A, Figure 3—source data 1) and 4.5 (±2.3; 95% confidence interval: 1.9–7.1; n = 3) phagosomes were associated with a HC. In some utricles, we detected overlap of tdTomato and phalloidin signals, indicating that some phagosomes were derived from SCs (Figure 4C–E’). It was unclear if phagosomes were generated by a single SC or by two or more adjacent SCs, but phagosomes were consistently derived from the most basal region of a SC (Figure 4D–E’). SCs, not macrophages, produce phagosomes in adult mouse utricles under normal conditions. (A,B) Confocal projection images of the utricular macula from 7-week-old Plp1-CreERT2:ROSA26tdTomatomice showing the numbers and distribution of tdTomato-positive SCs (magenta) in the utricular sensory epithelium of mice that received no tamoxifen (A) or mice that received tamoxifen (B). S, striola; SE, sensory epithelium; TE, transitional epithelium. See Figure 4—source data 1 for quantification of tdTomato-positive SCs in extrastriolar and striolar regions. (C–E’) Higher magnification optical sections of a Plp1-CreERT2:ROSA26tdTomatomouse utricular macula at one week post tamoxifen showing overlap between tdTomato-labeled SC cytoplasm (magenta) and a F-actin-rich phagosome (green, arrows). (C) Xy view with double lines indicating where cross-sectional images were created in D-E’. (D,D’) Yz view of same area in C.( E,E’) Xz view of same area in C. Very bright green labeling in D and E is F-actin in the stereocilia bundles of HCs. (F,G) Confocal optical sections of an adult Swiss Webster utricle. (F) Two F-actin-rich phagosomes (green, arrows) in the SC nuclear layer (DAPI, blue) did not co-label for antibodies to IBA1, a macrophage/monocyte lineage marker (magenta). (F’) An IBA1-positive cell (magenta, arrowhead) resided in the connective tissue under the phagosomes shown in F. (G) Xz view of the field shown in F,F’. The white dotted line indicates the border between sensory epithelium (SE) and connective tissue (CT). Arrows and arrowhead indicate the same cells shown in F,F’. (H) Confocal projection image of the utricular macula from an adult Lfng-eGFP mouse showing eGFP-positive SCs (green) in the sensory epithelium (SE). S, Striola. (I–I”’) Confocal optical sections of the same field from the extrastriolar region of a Lfng-eGFP utricle, with eGFP in green and F-actin in blue. (I) Xz view through the SE and CT of the utricle. (I’,I”) Xy views of the SC layer in the SE. (I”’) Xy view of the CT. The dotted line in I is the approximate location of the basal lamina, between the SE and the CT. Two phagosomes (arrowheads, F-actin, blue) are flanked by eGFP-positive SCs (green) and are also co-labeled with eGFP (green); co-labeled phagosomes appear cyan. One phagosome (arrow in I’,I”) is eGFP-negative and not flanked by eGFP-positive SCs. The double lines in I’–I”’ indicate the position of the xz view shown in I. Scale bar in A is 100 µm and applies to A,B,H. Scale bar in C is 5 µm and applies to C–G. Scale bar in I is 5 µm and applies to I–I”’. 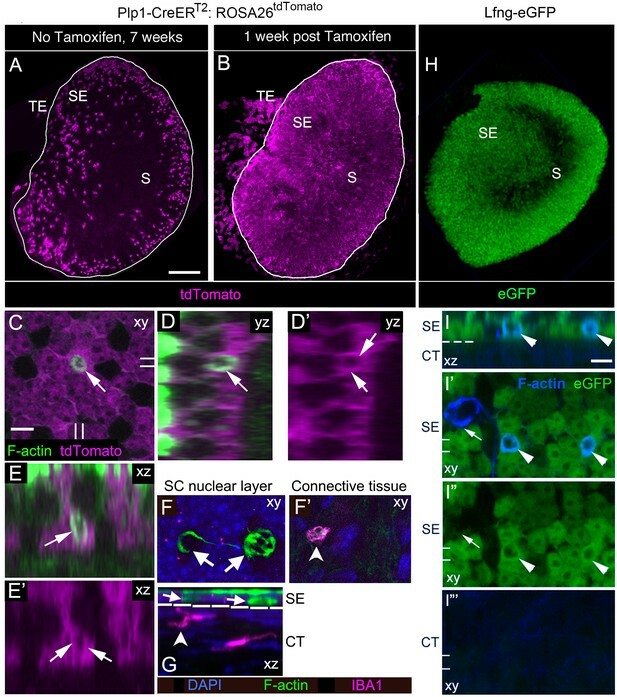 SCs, cells in the transitional epithelium, and cells in the connective tissue underlying the sensory epithelium (presumed Schwann cells) were labeled by tdTomato in Plp1-CreERT2:ROSA26tdTomato mice. To further delineate which cell types contribute to the production of phagosomes, we examined utricles from Lfng-eGFP mice, which express eGFP under control of Lfng regulatory elements (Gong et al., 2003). 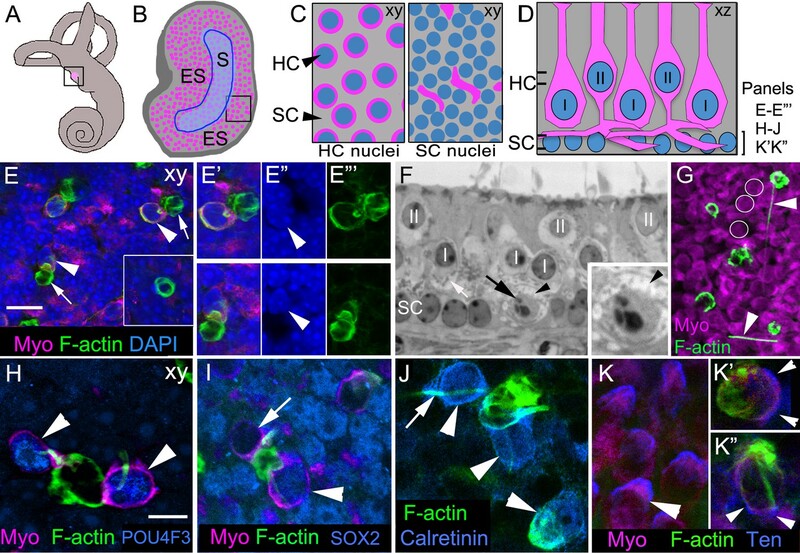 In Lfng-eGFP utricles, eGFP was expressed in the majority of SCs, but not in HCs, cells in the transitional epithelium, or the underlying connective tissue (Figure 4H–I”’; Burns et al., 2015). F-actin-labeled phagosomes were also detected in the basal compartment of the sensory epithelium of Lfng-eGFP utricles, and some were co-labeled with eGFP (Figure 4I–I”), providing further evidence that phagosomes derive from SCs. To assess if cells from the macrophage/monocyte lineage also phagocytose HCs under normal conditions, we labeled adult Swiss Webster utricles with myosin VIIa to detect HCs and ionized calcium-binding adaptor molecule 1 (IBA1) or CD68 to detect resting or activated macrophages, respectively (Holness et al., 1993; Imai et al., 1996; Ito et al., 1998). We also applied phalloidin to label phagosomes and DAPI to label nuclei. F-actin-labeled phagosomes in the sensory epithelium never co-localized with IBA1 labeling (Figure 4F,G) or CD68 labeling (not shown), although we consistently detected cells that were IBA1-positive (Figure 4F’,G) or CD68-positive (not shown) in the connective tissue below the macula. These results are consistent with a previous study that did not detect macrophages in the utricular macula of normal adult mice (Kaur et al., 2015). Our observations demonstrate that SCs, not macrophages, clear type I and II vestibular HCs from adult mouse utricles under normal conditions by creating F-actin-rich phagosomes. Numbers of total utricular HCs and SCs seem to be stable in adult mice at the ages we examined (Kirkegaard and Nyengaard, 2005; Burns et al., 2012). Therefore we reasoned that if HCs are cleared from the macula, they must be replaced. To address this, we looked for evidence of ongoing HC addition by assessing if HCs in normal adult utricles express two markers specific for immature HCs, protocadherin15-CD2 (PCDH15-CD2) and ATOH1. PCDH15 is a protein localized to the tip links of HC stereocilia. Two alternatively spliced variants of PCDH15 (CD1 and CD3) are present in mature stereocilia (Ahmed et al., 2006). In contrast, PCDH15-CD2 is detected along the length of stereocilia during early development, but becomes confined to the kinocilium once HCs mature (Ahmed et al., 2006; Webb et al., 2011). Thus, PCDH15-CD2 is a selective marker of immature stereocilia. As positive controls, we labeled utricles from neonatal (<8 day-old) Swiss Webster mice with antibodies to PCDH15-CD2 and with phalloidin to mark stereocilia. In the periphery of the utricle, where newly formed HCs are differentiating in neonates (Burns et al., 2012), we detected numerous HCs with PCDH15-CD2 labeling throughout the stereocilia (Figure 5A). Next, we examined utricles from 6- to 9-week-old CBA/CaJ and Swiss Webster mice. We observed small numbers of HCs with PCDH15-CD2 labeling throughout stereocilia in adult utricles (Figure 5B), primarily in the most peripheral portion of the extrastriolar region (Figure 5C). CBA/CaJ and Swiss Webster mice had 17.2 (±4.0) and 24.0 (±8.8) HCs with the immature labeling pattern for PCDH15-CD2, respectively (Figure 5D, Figure 5—source data 1). Immature HCs are found in adult mouse utricles under normal conditions. (A,B) Confocal xy optical sections of utricles from neonatal (<postnatal day 8) (A) and adult (>6 weeks) (B) Swiss Webster mice. Some HC stereocilia bundles at each age (arrows) were co-labeled with F-actin (green) and antibodies to PCDH15-CD2 (magenta). Some PCDH15-CD2 labeling occurred in other places on the epithelial surface, but our analysis was restricted to stereocilia only. White lines indicate the approximate location of edge of the utricular macula. (C) Schematized map of a utricle from a representative adult Swiss Webster mouse. HCs with PCDH15-CD2-positive stereocilia are depicted by black dots. S, striola. (D) Number of PCDH15-CD2-expressing HC stereocilia bundles per utricle in normal adult CBA/CaJ and Swiss Webster mice, where there was no statistically significant difference (determined by an unpaired two-tailed Student’s t-test; p=0.1635, see Figure 5—source data 1). Data are expressed as mean +1 standard deviation. (E) Confocal projection image through the utricular macula of a 6-week-old Atoh1GFP/GFP mouse expressing ATOH1-GFP fusion protein (green). S, striola. (F,G) Schematics of cross-sectional views through a 6-week-old Atoh1GFP/GFP mouse utricle shown in F’–F’” and G’–G’”. (F’–F”’) Confocal optical section of a HC [arrowhead; myosin VIIa (Myo), magenta; DAPI, blue] that expressed ATOH1-GFP (green). (G’–G”’) Confocal optical section of a SC (arrow; DAPI, blue) that expressed ATOH1-GFP (green). HC, HC nuclear layer; SC, SC nuclear layer; BL, basal lamina. Scale bar in B is 12 µm and applies to A,B. Scale bar in E is 100 µm. Scale bar in G’’’ is 10 μm and applies to F’–G’’’. ATOH1 is a transcription factor that is abundant in early differentiating HCs and weakly expressed in mature HCs (Lanford et al., 2000; Chen et al., 2002; Woods et al., 2004; Cai et al., 2013). We examined utricles collected from 6-week-old Atoh1GFP/GFP mice, which express an ATOH1-GFP fusion protein under control of the endogenous Atoh1 promoter (Rose et al., 2009). In Atoh1GFP/GFP mice, ATOH1-GFP is abundant in developing cochlear HCs but is lost once HCs mature (Cai et al., 2013). Using antibodies to amplify the GFP signal, we detected numerous GFP-positive cells that were concentrated in the extrastriola (Figure 5E). We counted 82.3 (±25.7) brightly labeled HCs and 8.3 (±2.9) brightly labeled SCs per utricle (Figure 5F–G”’, Figure 5—source data 1). HCs were identified as myosin VIIa-positive cells with nuclei in the apical two-thirds of the epithelium (Figure 5F–F”’). SCs were identified as myosin VIIa-negative cells whose bodies extend across the entire macular depth, whose nuclei are smaller than HC nuclei, and are positioned near the basal lamina (Figure 5G–G”’). We also detected 8.0 (±2.6) brightly labeled cells per utricle that did not meet criteria for HCs or SCs. Often, these cells were myosin VIIa-negative with a nucleus located between the SC and HC nuclear layers and had thick apical necks. We postulate that these cells were SCs in the process of transitioning to a HC fate. Collectively, these observations demonstrate that immature HCs exist in adult mouse utricles under normal conditions. The presence of immature HCs in utricles from normal adult mice is consistent with the hypothesis that new HCs are added in adulthood. Based on previous work (Lin et al., 2011; Burns et al., 2012), the likely source of new HCs is neighboring SCs. To determine if utricular HCs derive from SCs in normal adult mice, we used Plp1-CreERT2:ROSA26tdTomato mice, in which tamoxifen induces tdTomato expression in SCs (Figure 4B, Figure 4—source data 1). Prior to fate-mapping, we determined that 91.7% (±6.1%; n = 3) of extrastriolar SCs were tdTomato-positive one week after tamoxifen injection (Figure 4—source data 1). We hypothesized that most new HCs would be added in this region, since we detected most HCs with immature markers (PCDH15-CD2 and ATOH1-GFP) there (Figure 5C,E). At 15 weeks post tamoxifen, the latest time analyzed in this fate-mapping study, 85.9% (±3.2%; n = 3) of extrastriolar SCs were labeled (Figure 4—source data 1). The concentration of Plp1-CreERT2 activity in the extrastriola throughout the time-course of our experiment indicated that this mouse line could effectively record the transition of SCs into HCs. To fate-map the transition of SCs into HCs during adulthood, we gave tamoxifen to 6-week-old Plp1-CreERT2:ROSA26tdTomato mice and examined utricles at 1, 4, 10, or 15 weeks later (Figure 6A). We assessed whether the number of tdTomato-positive HCs increased over time after induction of tdTomato labeling, as predicted if SCs convert into HCs. Utricles were labeled with antibodies to myosin VIIa and DAPI, and we collected optical slices throughout the entire macula using confocal microscopy. tdTomato-positive HCs (Figure 6B–C’’’) were identified in all utricles and were scattered throughout the macula, but they appeared to be most common in the extrastriola (Figure 6F), which is consistent with findings for immature HC markers (Figure 5C,E). SCs produce new type II HCs in adult mouse utricles under normal conditions. (A) Experimental timeline. Plp1-CreERT2:ROSA26tdTomato mice were injected with tamoxifen (Tam) at 6 weeks of age to label SCs with tdTomato and were sacrificed (Sac) at 7, 10, 16, and 21 weeks of age (corresponding to 1, 4, 10, and 15 weeks post tamoxifen). Control animals (age-matched Plp1-CreERT2:ROSA26tdTomato mice that did not receive tamoxifen) were sacrificed at the same ages. (B–C”’) Examples of a tdTomato-labeled (magenta) type I HC (B–B”’) and type II HC (C–C”’) from a Plp1-CreERT2:ROSA26tdTomato mouse utricle at 10 weeks post tamoxifen, which were classified according to criteria defined in Materials and methods, Figure 1D, and Video 4. (B,B’ and C,C’) xy slices taken at the levels indicated in the schematic to the left. Myosin VIIa (Myo) is in green and DAPI is in blue. Thin arrows in B,B’ point to two type I HCs, at the level of the neck (B) and the nucleus (B’). Only the type I HC on the right is tdTomato-positive, which is most evident in its nucleus (B’). Fat arrows in C,C’ point to two type II HCs, at the level of the neck (C) and the nucleus (C’). Only the type II HC on the left is tdTomato-positive. (B”,C”) Xz view of the same cells shown in B–B’ and C–C’, providing perspective on their morphology and lamination. Labels indicate the approximate positions of the nuclei for each cell type (HCII, type II HC; HCI, type I HC; and SC, SC). (B”’,C”’): Same images as B”,C”, but with Myo labeling only. Scale bar in C is 10 µm and applies to B–C’. Scale bars in B’’,C’’ are 10 µm and apply respectively to B’’’ and C’’’. It is important to note that, in thin optical slices such as these, myosin VIIa labeling intensity varied across cells, independent of tdTomato labeling intensity. For example, in panels C” and C”’, the type II HC on the left is brighter than the type II HC on the right. Further, in panels B’,B”, the myosin VIIa labeling for type I HC perinuclear cytoplasm was relatively weak, and labeling at the neck (B) was more robust. In cases such as this one, other morphological criteria—nuclear position, relative neck thickness, and presence/absence of a basolateral process—were essential for cell-typing. (D) Total number of tdTomato-expressing HCs per utricle, categorized by HC type [type I (black), type II (blue), and ‘unknown’ (orange)]. Patterned bars = control Plp1-CreERT2:ROSA26tdTomato mice that did not receive tamoxifen. Solid bars = Plp1-CreERT2:ROSA26tdTomato mice that received tamoxifen at 6 weeks of age. Data are expressed as mean ±1 standard deviation for n = 4–8 mice (see Figure 6—source data 1). *p<0.05; ****p<0.0001 as determined by a two-way ANOVA (p<0.0001 for treatment/age; p<0.0001 for HC type) followed by Tukey’s multiple comparisons post-test. (E) Linear regression analysis of tdTomato-expressing type II HCs per utricle demonstrated an increase in labeled cells with time (data correspond to D, blue solid bars). The calculated slope was 1.97 type II HCs per week, and the R2 value was 0.691. Data are expressed as mean ±1 standard deviation with dotted lines representing the 95% confidence interval. (F) Map of a representative Plp1-CreERT2:ROSA26tdTomato utricle injected with tamoxifen at 6 weeks of age and analyzed 15 weeks later. tdTomato-labeled HCs are depicted by magenta dots. S, striola. We counted tdTomato-positive HCs in each utricle that were type I or type II at 1, 4, 10, or 15 weeks post tamoxifen using several criteria (see Materials and methods, Video 4, Figure 1D). Any cells that did not match criteria were scored as ‘unknown.’ Examples of tdTomato-positive type I and II HCs are shown in Figure 6B–B”’ and Figure 6C–C”’, respectively. At one week post tamoxifen, we detected 4.0 (±4.5) tdTomato-positive type I and 8.5 (±4.8) tdTomato-positive type II HCs per utricle (Figure 6D, Figure 6—source data 1), which were not significantly different from age-matched no-tamoxifen controls (Figure 6D, Figure 6—source data 1). 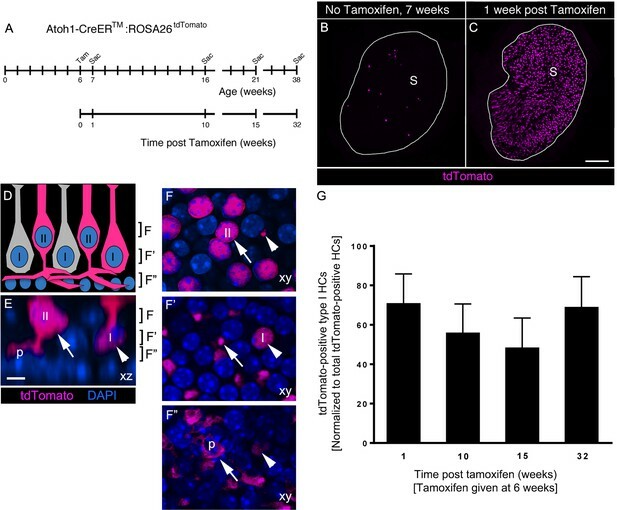 In tamoxifen-treated mice, the number of tdTomato-positive type II HCs per utricle increased over time from 8.5 (±4.8) cells at one week post tamoxifen to 36.6 (±7.7) cells at 15 weeks post tamoxifen (p<0.0001 for effect of treatment/time post tamoxifen; p<0.0001 for effect of HC type, determined by two-way ANOVA followed by Tukey’s multiple comparisons test). However, there was no significant change in numbers of tdTomato-positive HCs that were type I or ‘unknown’ during this time (Figure 6D, Figure 6—source data 1). Linear regression analysis showed that the average number of tdTomato-positive type II HCs increased by ~2 cells per week (Figure 6E). In mice that did not receive tamoxifen, there was no significant change in tdTomato-positive HCs of any type over time (Figure 6D). Clearly stratified type I and type II HCs in the adult mouse utricle. This movie begins at the cuticular plate of the HCs, proceeds through the level of HC necks, type II HC nuclei (HCII), type I HC nuclei (HCI), and ends in the SC nuclear layer where type II HC basolateral processes are located. An example of a type II HC basolateral process is shown by the arrow. 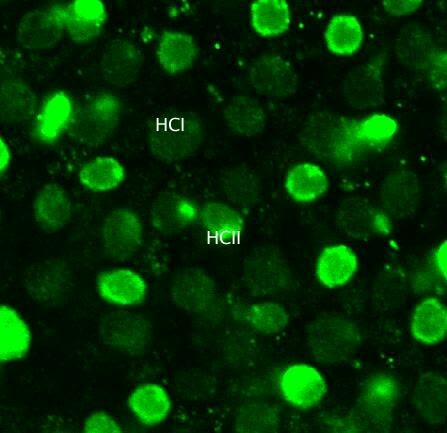 Myosin VIIa antibodies were used to label all HCs (green). To test if new HCs derive from division of SCs, we administered the thymidine analog 5’-bromodeoxyurdine (BrdU) to normal adult mice. BrdU was delivered using two different routes of administration (intraperitoneal injection and drinking water) and different dosing regimens for up to two weeks of continuous administration. We examined utricles after BrdU treatment from 18 adult mice, including both C57Bl/6J and Swiss Webster strains (Table 1). We routinely detected strongly BrdU-labeled nuclei in within-animal positive control tissue (intestinal epithelium and utricular connective tissue), but we found only one example of a BrdU-labeled pair of cells in the utricular macula (not shown). Therefore, if SCs divide during HC turnover, they do so rarely. These observations are consistent with the slow rate of HC addition that we observed and with previous studies of cell division in the macula of normal mice (Li and Forge, 1997; Kuntz and Oesterle, 1998). Detection of utricular SC proliferation under normal conditions. We used two delivery methods and 3 different time periods of exposure to administer BrdU to mice to investigate cell proliferation in the utricular sensory epithelium (SE) in two strains of mice (C57Bl/6J and Swiss Webster) that were older than 6 weeks. BrdU was either injected intraperitoneally (IP) or administered per os (PO) in the drinking water. SD, one standard deviation. Our observations indicate that, although type I and type II HCs are cleared from the macula under normal conditions, only type II HCs are replaced by Plp1-CreERT2-expressing SCs. This finding raised the question of how type I HCs are maintained in adulthood. We hypothesized that type II HCs might convert into type I HCs. To test this hypothesis, we fate-mapped type II HCs under normal conditions in adult utricles using Atoh1-CreERTM:ROSA26tdTomato mice in which CreER expression is driven by an Atoh1 enhancer (Chow et al., 2006). After tamoxifen administration to 6-week-old Atoh1-CreERTM:ROSA26tdTomato mice, we used myosin VIIa immunolabeling and cell classification criteria (Figure 1D, Materials and methods, Video 5) to determine that no SCs were tdTomato-positive at one week post tamoxifen. Using the same criteria, we determined that 92.7% (±2.8%) of tdTomato-labeled cells were type II HCs and 5.9% (±3.0%) were type I HCs (Figure 7C–F”, Figure 7—source data 1). Assuming a total utricular HC population of 3800 (Golub et al., 2012) and a type I:type II ratio of 1.17:1 (Pujol et al., 2014), we estimate that ~2.5% of type I HCs and ~39.3% of type II HCs were labeled in Atoh1-CreERTM:ROSA26tdTomato mouse utricles. Age-matched control mice that did not receive tamoxifen had fewer than 15 labeled HCs per utricle, indicating a low level of Cre activity in the absence of tamoxifen (Figure 7B, Figure 7—source data 1). Type I and type II HCs labeled with Atoh1-CreERTM:ROSA26tdTomato. This movie was constructed from optical sections collected from the area shown in Figure 7E–F’’. The movie begins at the cuticular plate, passes through HC necks, type II HC nuclei, type I HC nuclei, SC nuclei, and ends at the basal lamina. About 10 type II HCs and one type I HC (arrow) are labeled with tdTomato (red). All nuclei are labeled with DAPI (blue). At the level of the type II HC nuclei, the type I HC neck (arrow) can be seen. At the level of the SC nuclei, tdTomato-labeled type II basolateral processes are observed. Atoh1-CreERTM-labeled type II HCs do not convert into type I HCs over 8 months in adult mouse utricles under normal conditions. (A) Experimental timeline. Atoh1-CreERTM: ROSA26tdTomato mice were injected with tamoxifen (Tam) at 6 weeks of age and were sacrificed (Sac) at 7, 16, 21, and 38 weeks of age (corresponding to 1, 10, 15, and 32 weeks post tamoxifen). 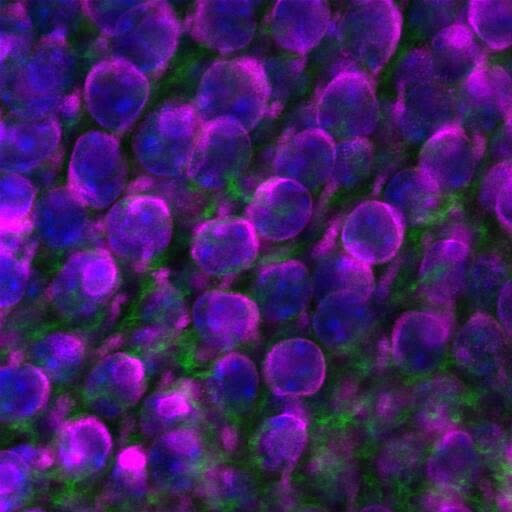 (B,C) Confocal projection images of whole utricles from 7-week-old Atoh1-CreERTM:ROSA26tdTomato mice showing the numbers and distribution of tdTomato-positive SCs (magenta) in the utricular sensory epithelium of mice that received no tamoxifen (B) or mice that received tamoxifen (C) S, striola. (D–F”) Examples of tdTomato-labeled type I and type II HCs. (D) A schematic of a cross-section through the utricular macula, with brackets indicating the optical sections generated for F–F”. I, type I HC; II, type II HC. (E) Xz view (similar to D) of images used to generate F–F”, taken from the extrastriolar region of an Atoh1-CreERTM:ROSA26tdTomato mouse at one week post tamoxifen. Brackets indicate the location of optical sections shown in F–F”. Arrow points to a tdTomato-positive type II HC (II) with a basolateral process (p). Arrowhead points to a tdTomato-positive type I HC (I) with a thin neck and more basally located nucleus than the type II HC. tdTomato is shown in magenta; DAPI is shown in blue. (F–F”) Progressively deeper optical xy sections through the utricular macula. Arrows and arrowheads point to same HCs as shown in E. Note that the type II HC has an apically located nucleus (arrow, [E,F]) and a basolateral process (arrows, E,F’,F”; p, E,F’’). Note that the type I HC (arrowhead, [E]) has a thin neck (arrowhead, [F]), a basally located nucleus (arrowhead, [F’]) and no basolateral process (arrowhead, [F”]). Scale bar in C is 100 μm and applies to B,C. Scale bar in E is 6 µm and applies to E–F”. (G) Number of tdTomato-positive type I HCs at 1, 10, 15, and 32 weeks post tamoxifen normalized to the total number tdTomato-positive cells at each timepoint (see Figure 7–source data 1 for raw data). No significant differences in tdTomato-positive type I HCs were observed across time (determined by ANCOVA, p=0.103; n = 4). Data are expressed as mean ±1 standard deviation. Next, we tested if the number of tdTomato-labeled type I HCs increased over time, as one would predict if significant numbers of labeled type II HCs were to convert into type I HCs. We administered tamoxifen to Atoh1-CreERTM:ROSA26tdTomato mice at 6 weeks of age and euthanized them at 10, 15, or 32 weeks post tamoxifen (Figure 7A). Control mice that did not receive tamoxifen were euthanized at 16, 21, and 38 weeks of age (Figure 7A). Using analysis of covariance (ANCOVA) to control for variability in the total number of tdTomato-labeled cells across timepoints, we found no significant change in tdTomato-labeled type I HCs between 1 and 32 weeks post tamoxifen (p=0.103; Figure 7G, Figure 7—source data 1). These observations demonstrate that few, if any, type II HCs labeled in Atoh1-CreERTM:ROSA26tdTomato mice transdifferentiated into type I HCs during the 8-month period we examined. Our results demonstrate that SCs transdifferentiate into type II HCs at a low rate under normal conditions. To determine if SC transdifferentiation is increased after destruction of HCs, we bred Plp1-CreERT2:ROSA26tdTomato mice with Pou4f3DTR mice, in which the human diphtheria toxin receptor (DTR) is knocked into the endogenous coding region for Pou4f3, a HC-specific transcription factor (Golub et al., 2012). Injection of diphtheria toxin (DT) to mice with a single Pou4f3DTR allele kills all but 6% of HCs in the utricle, and over the next two months, HC numbers are restored to 17% of normal levels (Golub et al., 2012). This study found that only type II HCs are regenerated. Since type II HCs constitute half of the normal HC population, we assume that ~34% of the type II HC population is regenerated. We injected Plp1-CreERT2:ROSA26tdTomato:Pou4f3DTR mice with tamoxifen at 6 weeks of age, then with DT one week later (Figure 8A). Utricles were collected and labeled with antibodies against myosin VIIa at 3 weeks post DT (equivalent to 4 weeks post tamoxifen). We expected, based on our prior study (Golub et al., 2012), that HC regeneration would be well underway at this point and we would detect tdTomato-labeled HCs if SCs generated new HCs. Age-matched Plp1-CreERT2:ROSA26tdTomato mice (lacking the Pou4f3DTR allele) were treated identically and served as negative controls, since DT causes no vestibular HC loss when administered to mice lacking the Pou4f3DTR allele (Golub et al., 2012). DT-mediated HC damage increases SC-to-HC transition in adult mouse utricles. (A) Experimental timeline. Plp1-CreERT2:ROSA26tdTomato:Pou4f3DTR (damaged) mice and Plp1-CreERT2:ROSA26tdTomato (control) mice were injected with tamoxifen (Tam) at 9 weeks of age to label SCs with tdTomato, injected with diphtheria toxin (DT) at 10 weeks of age to kill HCs, and sacrificed (Sac) at 13 weeks of age (corresponding to 4 weeks post tamoxifen and 3 weeks post DT). (B) Utricles from control mice (Plp1-CreERT2:ROSA26tdTomato) that received DT injection but lacked the Pou4f3DTR allele exhibited normal-appearing HC densities [myosin VIIa (Myo), green]. S, striola. (C) Utricles from damaged Plp1-CreERT2:ROSA26tdTomato:Pou4f3DTR mice sacrificed 3 weeks post DT had fewer HCs (Myo, green). 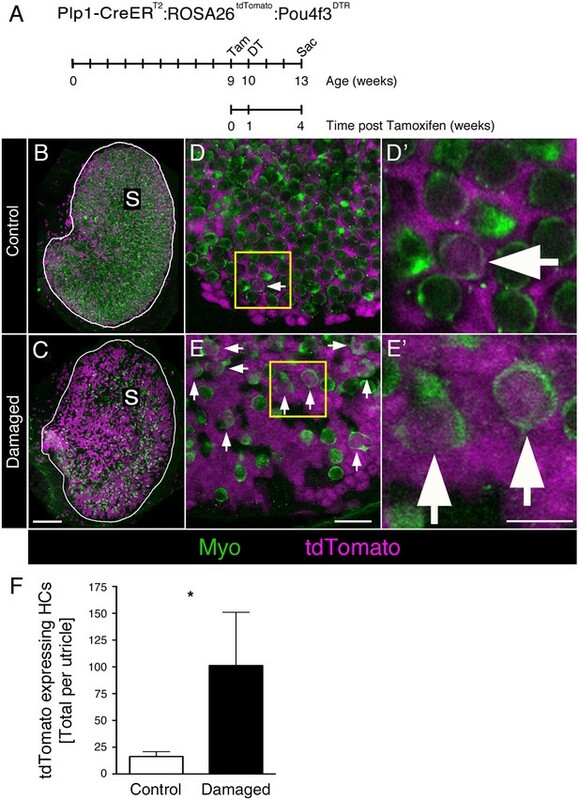 SCs were labeled with tdTomato (magenta) in both control and damaged adult mouse utricles (B,C). S, striola. (D,E) Confocal optical images of the extrastriolar region from similar utricles as shown in B and C, acquired at higher magnification. (D’,E’) Higher magnifications of the boxed areas in D,E. tdTomato-expressing HCs (arrows) were detected in control (D,D’) and damaged (E,E’) utricles. Scale bar in C is 100 µm and applies to B,C. Scale bar in E is 20 µm and applies to D,E. Scale bar in E’ is 10 µm and applies to D’,E’. ( F) Total number of tdTomato-expressing HCs at 13 weeks of age (equivalent to 3 weeks post DT and 4 weeks post tamoxifen) in control (white bar, n = 3) and damaged (black bar, n = 4) utricles (see Figure 8—source data 1). Damaged utricles had significantly more tdTomato-labeled HCs compared to control utricles determined by an unpaired, two-tailed Student’s t-test (p=0.0346). Data are expressed as mean ±1 standard deviation. Utricles from control mice showed normal-appearing HC numbers (Figure 8B,D–D’). By contrast, utricles from Plp1-CreERT2:ROSA26tdTomato:Pou4f3DTR mice had a large reduction in HC numbers after DT treatment (Figure 8C,E–E’). We counted 424.8 (±119.0; 95% confidence interval: 308.1–541.4; n = 4) HCs per utricle (~12% of controls), the vast majority of which were type II, as expected. When we scored HCs for tdTomato labeling, we found that significantly more tdTomato-labeled type II HCs were present in damaged versus control utricles (Figure 8F; p=0.0346; unpaired, two-tailed Student’s t-test). During the 4-week period after tamoxifen injection, SCs generated 6 times more tdTomato-labeled type II HCs in damaged utricles (101.3 ± 49.7) compared to controls (16.3 ± 4.5) (Figure 8F, Figure 8—source data 1). Assuming a HC population of 3800 (Golub et al., 2012), 0.4% (±0.1%) of HCs were tdTomato-labeled in control utricles. In contrast, 23.9% (±8.2%) of HCs were tdTomato-labeled in damaged utricles (Figure 8—source data 1). These results demonstrate that SCs in adult mouse utricles mount a truly regenerative response to damage, significantly increasing transdifferentiation into type II HCs relative to baseline levels. Our findings raised the question: do mechanisms of HC clearance following DT-induced HC damage resemble those during normal conditions? To address this, we labeled utricles from Pou4f3DTR mice at 4, 7, 14, 40, 90, or 120 days post DT, as well as from littermates that lacked the Pou4f3DTR allele (labeled as 0 day post DT) with antibodies to myosin VIIa, TUNEL, and DAPI (Figure 9A–D). Degenerating HCs were abundant at 4 and 7 days post DT (Figure 9B–C), as described previously (Golub et al., 2012). Degenerating HCs, seen in their normal positions, had myosin VIIa in their nuclei, which was not observed in utricles under normal conditions (Figure 9A–B”). Further, degenerating HCs had nuclei with apoptotic features: some nuclei had abnormal shapes and/or condensed chromatin (Figure 9B–B”), and some nuclei were TUNEL-positive (Figure 9C). By contrast, HCs that were being cleared under normal conditions were ectopic (located near the basal lamina), and most had healthy-appearing nuclei (Figure 1E–E’”). DT-mediated HC damage induces apoptosis and a small increase in phagosome numbers in adult mouse utricles. (A–A”) The same field of a control (Pou4f3DTR-negative) utricle, focused on the type II HC layer. (B–B”) The same field of a Pou4f3DTR utricle at 4 days post DT, focused on the HC layer. Green arrowheads point to myosin VIIa-labeled HCs (Myo, magenta in A,B; white in A’,B’), while green arrows point to a nucleus (DAPI, blue in B; white in B’’) with condensed chromatin. (C) Projection image of a Pou4f3DTR utricle at 7 days post DT. 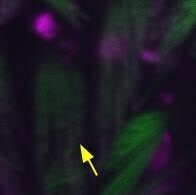 Arrowheads point to F-actin-rich (green) phagosomes, while arrows point to TUNEL-labeled (magenta) DNA. Scale bar in A is 6 µm and applies to A–B”. Scale bar in C is 5 µm. (D) Total number of phagosomes per Pou4f3DTR utricle at different times post DT. See Figure 9–source data 1 for raw data. There were significantly more phagosomes at 4 and 7 days post DT compared to control littermates lacking the Pou4f3DTR allele (0 day post DT) determined by a one-way ANOVA (p<0.0001) followed by a Dunnett’s multiple comparisons test (*p<0.05: n = 3–7). Data are expressed as mean +1 standard deviation. Somewhat surprisingly, few TUNEL-positive nuclei seen after DT treatment were associated with F-actin-rich phagosomes (Figure 9C). The number of phagosomes per utricle increased significantly over time (p=0.0001; one-way ANOVA; n = 3–7), with 4 and 7 days post DT showing a ~60% increase relative to controls (p<0.05; Dunnett’s multiple comparisons test). Phagosome numbers returned to control levels at later times post DT (Figure 9D, Figure 9—source data 1). This increase was much lower than expected if F-actin-rich phagosomes play a major role in HC clearance after DT-induced HC death, since we previously showed a decrease of >2000 HCs during the first 7 days post DT in Pou4f3DTR mice (Golub et al., 2012). The vestibular epithelia of the inner ear are composed of sensory HCs and non-sensory SCs that are derived from the otic placode. Our data show that, in utricles of adult mice, SCs remove type I and type II HCs under normal physiological conditions by phagocytosis and replace type II HCs by transdifferentiation. This study provides definitive evidence that vestibular epithelia are a site of ongoing HC turnover in adult mammals. In this sense, vestibular epithelia resemble other placodally derived neurosensory epithelia, such as taste buds (Okubo et al., 2009) and olfactory epithelia (Leung et al., 2007), which cull and replace sensory receptors throughout life. However, vestibular epithelia contrast sharply with the organ of Corti, the sensory organ of hearing, which is also derived from the otic placode, but in which no new HCs are formed under normal circumstances or after damage in adult mammals (Bohne et al., 1976; Hawkins et al., 1976; Forge et al., 1998; Oesterle et al., 2008; Cox et al., 2014). 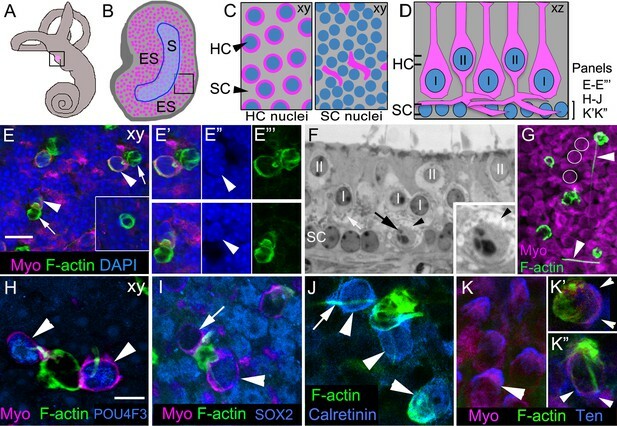 SCs, which are epithelial cells that resemble glia in several respects, serve many functions in HC epithelia, including maintaining structural integrity, clearing ions and neurotransmitters from extracellular space, and releasing neurotrophins to maintain synapses between HCs and neurons (reviewed in Monzack and Cunningham, 2013; Wan et al., 2013). SCs also phagocytose HCs that are injured by ototoxins or intense noise (Abrashkin et al., 2006; Bird et al., 2010; Anttonen et al., 2014). Our results demonstrate an additional, previously unknown role of SCs as phagocytes of type I and II vestibular HCs under normal conditions. While data from both Plp1-CreERT2:ROSA26tdTomato and Lfng-eGFP mice support the hypothesis that SCs act as phagocytes to remove HCs, we cannot rule out that other cell types in the organ also play this role. For instance, Schwann cells were also labeled by tdTomato in utricles of Plp1-CreERT2:ROSA26tdTomato mice, and they have phagocytic capabilities in the peripheral nervous system (Band et al., 1986; Reichert et al., 1994). We attempted to assess Schwann cell contribution to phagosomes, but we were unable to identify antibodies or CreER mouse lines that labeled Schwann cells without also labeling SCs. Plp1-CreERT2:ROSA26tdTomato mice also labeled cells in the transitional epithelium. However, these cells are unlikely sources of phagosomes, since the majority of phagosomes we observed were located in the central region of the macula, away from the transitional epithelium. Our study did not determine the reason why HC clearance is concentrated centrally. This finding is somewhat counterintuitive, since HC addition appears to be most abundant in the periphery. However, it is possible that HC clearance and HC addition are not spatially coupled. During development, addition of utricular HCs in rodents occurs in a central-to-peripheral gradient (Sans and Chat, 1982; Burns et al., 2012). Since we found HC clearance to be focused centrally, we hypothesize that the oldest HCs are being removed. During adulthood, peripherally added HCs might migrate toward the center over time, where they are eventually cleared. These hypotheses remain to be tested. Since our study involved analysis of static images, we were unable to determine the temporal sequence of events, how quickly HCs are removed, how many HCs are cleared by SCs per week, the dynamics of phagosome formation, or the lifespan of phagosomes. However, based on our observations, we generated a model (Figure 10A) that should be tested using live-cell imaging and serial immuno-electron microscopy. We propose that the first sign a HC has been ‘selected’ for clearance is the appearance of a large actin spike in its cytoplasm. Actin-rich cables or ‘cytocauds’ are also observed in HC cytoplasm of adult utricles in mice (Sobin et al., 1982), guinea pigs (Flock et al., 1979; Kanzaki et al., 2002), and humans (Taylor et al., 2015). We suspect this actin spike is either derived from the HC itself or from a SC that has been signaled to ‘attack’ the HC. We hypothesize that this spike extends and becomes anchored basally, at which point the HC body is translocated to the basal compartment. Once translocated, adjacent SCs create basket-like phagosomes and consume the HC. However, it is also possible that the actin spike does not play a role in HC clearance. Because we did not detect stereocilia in translocated HCs, we presume that the apical portion of each HC is cleaved by SCs and ejected apically before translocation, similar to what occurs after aminoglycoside toxicity (Meiteles and Raphael, 1994; Li et al., 1995; Bird et al., 2010; Monzack et al., 2015). However, it is also possible that stereocilia proteins are degraded in HCs prior to, or during, translocation. Model of HC turnover in adult mouse utricles under normal conditions. (A) Model of HC clearance. 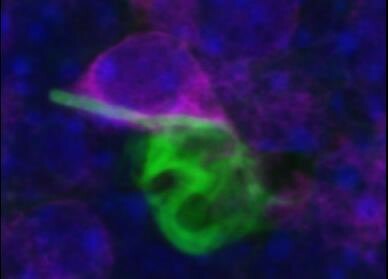 An actin spike (green) forms to connect SCs (grey) and a HC targeted for clearance (magenta). The apical portion of SCs converges and cleaves off the top of the HC, including the stereocilia. The actin spike aids the translocation of the HC to the SC nuclear layer, where SCs form an actin-rich phagosome and engulf the HC. Once the HC is removed from the sensory epithelium, an empty ring- or basket-like actin structure may remain until it is resorbed by SCs. (B,C) Model of type II HC addition. (B) Plp1-CreERT2-expressing SCs (grey) give rise to type II HCs (magenta) by first translocating their nuclei into the HC layer and becoming an intermediate cell type (dark magenta). Type II HCs that express Atoh1-CreERTM do not transdifferentiate into type I HCs. (C) Plp1-CreERT2-expressing SCs (grey) do not directly generate type I HCs (magenta) in adulthood. SC-derived phagosomes that clear HCs during turnover share some features with those that clear HCs after drug damage, including their high actin composition and shape. However in normal utricles, we found that HCs are pierced by a single actin spike and translocated to a basal position, which has not been reported after damage. Although the number of phagosomes increased after DT-mediated HC death, the increase was not proportionate to HC loss, and many apoptotic HCs were not localized near phagosomes. These observations suggest that F-actin-rich phagosomes derived from SCs play a minor role in removing HCs in mouse utricles after DT treatment, which is consistent with previous observations (Kaur et al., 2015). By contrast, F-actin-rich phagosomes derived from SCs actively clear utricular HCs following aminoglycoside treatments in vitro (Bird et al., 2010; Monzack et al., 2015). Further, we found that naturally occurring HC death does not trigger infiltration of immune-derived macrophages, which is robust after DT treatment (Kaur et al., 2015). Additional studies are needed to understand why different forms of HC degeneration trigger distinct forms of cell clearance. It is not clear why certain HCs are removed from the epithelium under normal conditions. Most HCs associated with phagosomes appear normal aside from their unusual basal position. They have a typical nucleus and protein expression and show no nuclear condensation that occurs during apoptosis, nor cell swelling characteristic of necrosis (reviewed in Nikoletopoulou et al., 2013). Nonetheless, HCs may be phagocytosed because they become damaged due to normal ‘wear and tear’ under physiological conditions. Thus, it is important to define the triggers for HC clearance. These could include degeneration of HCs or changes in innervation, cell membrane integrity, or other HC features. Further, SCs might act as primary phagocytes (Brown and Neher, 2012; Monzack and Cunningham, 2013). We demonstrate that SCs play a second critical role in maintaining vestibular epithelia under normal conditions: they form new HCs, presumably replacing those lost during clearance. Consistent with this, small numbers of immature HCs were detected in normal utricles of adult mice using two markers: PCDH15-CD2 and ATOH1-GFP. Recently, evidence for immature stereocilia bundles was found in utricles of aged humans (>60 years old) (Taylor et al., 2015), suggesting HC turnover may also occur in adult primates. Two prior studies did not find evidence for ATOH1-immunolabeled cells (Wang et al., 2010) or cells with Atoh1 enhancer activity (Lin et al., 2011) in normal utricles from adult mice. These contrasting results may be due to different sensitivities of the methods used to assess Atoh1 expression. Fate-mapping of SCs in Plp1-CreERT2:ROSA26tdTomato mice provided additional evidence for new HC addition. We assume SCs are the sole source of new HCs in our experiments based on a large body of literature showing that SCs are progenitors to vestibular HCs in non-mammalian vertebrates during both regeneration and turnover (reviewed in Corwin and Oberholtzer, 1997; Warchol, 2011). However, transitional epithelial cells and Schwann cells were also labeled in utricles of Plp1-CreERT2:ROSA26tdTomato mice. Therefore, additional CreER lines are needed to fate-map these cell populations and determine if they are unexpected sources of HCs during turnover. Our data showed that SCs generate new type II HCs, but not type I HCs, under normal conditions (Figure 10B,C). These findings were surprising, since we detected clearance of both HC types. We hypothesized that type I HCs might be replaced by type II HCs since type II-to-I HC conversion has been suggested to occur after ototoxin-induced HC loss in avian utricles (Weisleder and Rubel, 1993; Zakir and Dickman, 2006). Additional support for this hypothesis was provided by Kirkegaard and Jørgensen (2001), who detected individual HCs that appeared to be a hybrid with properties of both type I and type II HCs in vestibular organs of adult bats. However, when we fate-mapped type II HCs in mice under normal conditions, there was no evidence of type II-to-I conversion over an 8-month period of early adulthood (Figure 10B). However, the rate of conversion could take longer than 8 months. Further, type I HCs may derive from type II HCs that were not fate-mapped in Atoh1-CreERTM:ROSA26tdTomato mice or from SCs that were not fate-mapped in Plp1-CreERT2:ROSA26tdTomato mice. It should be noted, however, that only type II HCs are replaced after drug-induced damage in adult guinea pigs (Forge et al., 1998) and mice (Kawamoto et al., 2009; Golub et al., 2012), supporting the interpretation that type I HC replacement is attenuated or perhaps impossible in adult mice. Regenerated HCs share many features with neighboring mature type II HCs, including myosin VIIa immunoreactivity, properly positioned nuclei, proper relative neck thickness, well defined stereocilia bundles, and basolateral processes. However, since we could not birth-date HCs in this study, we were not able to determine the degree to which new type II HCs are mature. Further, we did not perform any analyses that would inform on the functional status of the new HCs. Therefore, additional work is required to assess if HCs replaced in adult animals under normal conditions or after damage are functionally mature. We were unable to distinguish whether HCs added during normal conditions derive from the progeny of SC division or via direct transdifferentiation, during which SCs phenotypically convert into HCs without dividing (reviewed in Stone and Cotanche, 2007). Using multiple methods for BrdU administration, we only detected BrdU labeling in rare cells within the utricular macula, and their identity was not established. This finding is consistent with other studies that assessed SC division in normal utricles in vivo (Li and Forge, 1997; Kuntz and Oesterle, 1998). In contrast, dividing SCs are readily detected during HC turnover in mature birds (Roberson et al., 1992; Kil et al., 1997; Stone et al., 1999). We cannot rule out, however, that SCs divide at a very low rate and our methods were insufficient to record them. Indeed, mammalian utricles that were cultured and treated with aminoglycoside antibiotics generated new HC-like cells and SCs by mitotic division (Warchol et al., 1993). One possible interpretation for the discrepancy is that culture conditions promote utricular SC division. Prior fate-mapping studies showed that SCs form new vestibular HCs in juvenile and adult mice after HC damage (Lin et al., 2011; Slowik and Bermingham-McDonogh, 2013; Wang et al., 2015). In the present study, we found that, upon HC destruction, SC transdifferentiation into type II HCs increases by 6-fold over type II HC addition under normal conditions. This demonstrates that adult mammals are able to upregulate vestibular HC addition, relative to normal levels, upon HC injury. We can use several approaches to estimate the rate of HC turnover. SC fate-mapping in mice with a mixed genetic background indicated that ~2 HCs are added to each utricle per week. This rate is likely a slight underestimate, since we only fate-mapped ~90% of extrastriolar and ~70% of striolar SCs in the utricle. Further, there could also be other sources of added HCs that were not fate-mapped, such as cells in the transitional epithelium or even in the stroma. We assessed the rate of HC addition by examining two markers for immature HCs (PCDH15-CD2 and ATOH1-GFP) in mice with a range of backgrounds. These markers labeled ~20 and ~82 HCs per utricle, respectively, which suggests a higher rate of HC addition than fate-mapping. However, we do not know how long each marker is expressed in differentiating cells, so we cannot use these analyses to define the rate of HC addition. We can also assess the rate of turnover by estimating how many HCs die in a given period. Swiss Webster mice had ~50 phagosomes per utricle, of which ~12 were associated with HCs, while Plp1-CreERT2:ROSA26tdTomato mice on a mixed background had ~28 phagosomes per utricle, of which ~5 were targeting HCs. Only 10–15 phagosomes were detected in CBA/CaJ or C57Bl/6J mice. It is unclear why Swiss Webster mice have significantly more phagosomes than the other tested mouse strains. They may have a higher rate of HC turnover, or their phagosomes may remain in the utricle for a longer period of time than in other strains. Although we cannot deduce the lifespan of a phagosome or the duration of HC clearance in the current study, Monzack et al. (2015) showed in aminoglycoside-treated mouse utricles that a phagosome engulfed a HC, cleared it, and began retracting within 8 hr. If this time frame is similar in normal utricles, and we use the conservative estimate from Plp1-CreERT2:ROSA26tdTomato (mixed background) mice that 5 HCs at any given time are being targeted by phagosomes generated within an 8 hr period, then we can estimate that one HC is targeted for removal every 1.6 hr, which is equivalent to 15 HCs per day or 105 HCs per week. Since numbers of HCs are maintained in adult mice, this could suggest that as many as 105 HCs are added per week, which is considerably more than indicated by SC fate-mapping with Plp1-CreERT2:ROSA26tdTomato mice. Accordingly, live-cell imaging must be performed to define the lifespan of a phagosome in normal utricles, which may differ from the lifespan of phagosomes after HC damage. If we make a conservative estimate, based on SC fate-mapping alone, that 2 HCs are turned over per week, and we consider the mouse’s lifespan to be 18 months, with an average of 4.3 weeks/month, then we can estimate that 155 HCs, or 4% of the HC population, are turned over during a mouse’s lifetime. It seems unlikely that such a small degree of HC turnover would have a significant impact on vestibular homeostasis. However, we found evidence that type I HCs are cleared, but no evidence that type I HCs are replaced. A progressive loss of type I HCs over time or disruption in the balance of type II HC clearance and addition, for example during aging, could result in vestibular dysfunction. Park et al. (1987) measured a ~14% reduction in utricular HCs in old C57Bl/6NNia mice, and this reduction was similar for both type I and II HCs. By contrast, Kirkegaard and Nyengaard (2005) found no evidence of HC loss in aged outbred mice. Declines in vestibular function accompanying aging have been reported in some strains of mice (Shiga et al., 2005; Mock et al., 2011) and in humans (e.g., Agrawal et al., 2009), so it is important to further investigate if HC turnover is reduced with aging. Swiss Webster (stock #689), CBA/CaJ (stock #654), C57Bl/6J (stock #664), Plp1-CreERT2 (stock #5975; RRID:MGI:3696409; C57Bl/6J background; Doerflinger et al., 2003), ROSA26CAG-loxP-stop-loxP-tdTomato (ROSA26tdTomato)(also called Ai14, stock #7908; RRID:IMSR_JAX:007908; C57Bl/6J background; Madisen et al., 2010), and Atoh1GFP (stock #13593; RRID:IMSR_JAX:013593; C57Bl/6J background; Rose et al., 2009) mice were purchased from The Jackson Laboratory (Bar Harbor, ME). Lfng-eGFP mice (RRID:MMRRC_015881-UCD, CD1 background) were generated by the GENSTAT program (Gong et al., 2003), were provided by Dr. Andrew Groves (Baylor College of Medicine, Waco, TX) for this study, and are available from Mutant Mouse Resource and Research Centers (strain name: B6;FVB-Tg[Lfng-EGFP]HM340Gsat/Mmucd). Pou4f3DTR mice (C57Bl/6J or CBA/CaJ background; Golub et al., 2012) were provided by Dr. Edwin Rubel (University of Washington, Seattle, WA) and Atoh1-CreERTM mice (RRID:MMRRC_029581-UNC; FVB/NJ background; Chow et al., 2006) were provided by Dr. Suzanne Baker (St. Jude Children’s Research Hospital, Memphis, TN). Genotyping for Plp1-CreERT2, ROSA26tdTomato, Atoh1GFP, and Atoh1-CreERTM mice was performed by Transnetyx, Inc. (Cordova, TN). Genotyping for Pou4f3DTR and Lfng-eGFP mice was described previously (Golub et al., 2012; Burns et al., 2015). Both genders were used in all studies. Atoh1GFP/GFP mice carried two alleles (homozygous), and Plp1-CreERT2, ROSA26tdTomato, Pou4f3DTR, Atoh1-CreERTM, and Lfng-eGFP mice were heterozygotes. Crosses led to progeny with mixed strain background. All procedures were conducted in accordance with approved animal protocols from the Institutional Animal Care and Use Committees at the University of Washington (Seattle, WA) and Southern Illinois University School of Medicine (Springfield, IL). For fate-mapping and phagosome analyses in normal mice, tamoxifen [9 mg/40 g body weight, intraperitoneal injection (IP); Sigma-Aldrich (St. Louis, MO)] was injected once on two consecutive days in 6-week-old Plp1-CreERT2:ROSA26tdTomato and Atoh1-CreERTM:ROSA26tdTomato mice. For fate-mapping studies in damaged utricles, tamoxifen (6 mg/40 g body weight, IP) was injected once on two consecutive days in 9-week-old Plp1-CreERT2:ROSA26tdTomato:Pou4f3DTR mice, followed one week later by two intramuscular (IM) injections of DT. Each injection was 25 ng/g body weight, and there was a 48 hr interval between injections. DT was purchased from Sigma-Aldrich (St. Louis, MO) or List Biological Laboratories, Inc. (Campbell, CA). The different tamoxifen doses produced similar labeling of utricular SCs. Controls for normal utricles consisted of Plp1-CreERT2:ROSA26tdTomato and Atoh1-CreERTM: ROSA26tdTomato mice that did not receive tamoxifen injection and were housed separately from tamoxifen-treated mice. Controls for damaged utricles were littermates lacking the Pou4f3DTR allele (Plp1-CreERT2:ROSA26tdTomato mice) that received both tamoxifen and DT injections. For phagosome analyses in damaged utricles, DT was injected as described above, and mice were euthanized 4, 7, 14, 40, 90, or 120 days later. Controls were littermates lacking the Pou4f3DTR allele (Plp1-CreERT2:ROSA26tdTomato mice) that received both tamoxifen and DT injections. Methods for administering BrdU [Sigma-Aldrich (St. Louis, MO)] to adult mice are described in Table 1. Temporal bones were dissected, and a small hole in the temporal bone was generated adjacent to the oval window. Fixative (2% paraformaldehyde/3% glutaraldehyde in 0.1 M sodium phosphate buffer, pH 7.4) was injected into the hole, and temporal bones were immersion-fixed overnight at 4°C. Utricles were removed, and the otoconial membrane and otoconia were dissected away. Utricles were post-fixed in 1% osmium tetroxide and embedded in Eponate 12 Kit with DMP-30 (Ted Pella Inc., Redding, CA). Semi-thin sections (2 µm) were mounted onto gel-coated slides and stained with toluidine blue dye [Sigma-Aldrich (St. Louis, MO)]. Sections were imaged using a Zeiss Axioplan microscope (Zeiss, Jena, Germany). Temporal bones were removed and either submerged in electron microscopy grade 4% paraformaldehyde (Polysciences, Inc., Warrington, PA) overnight at room temperature or partially dissected to remove otoconia from the utricle before fixation in 4% paraformaldehyde for two hours at room temperature. After fixation, temporal bones were stored in PBS until whole utricles were dissected out of temporal bones and placed in 96-well plates for free-floating immunofluorescent labeling. Utricles were washed twice in 1X PBS, then permeabilized with 2 mg/ml bovine serum albumin [BSA, Sigma-Aldrich (St. Louis, MO)] and 1.0% Triton X-100 (Sigma-Aldrich, St. Loius, MO) in 1X PBS for 1 hr at room temperature. Utricles were then incubated in blocking buffer [10% normal horse serum (Vector Laboratories, Burlingame, CA) and 0.4% Triton X-100 in 1X PBS] at room temperature for 3 hr. Primary antibodies were diluted in blocking buffer and incubated overnight at 4°C, except for the anti-BrdU, anti-GFP, and mouse anti-myosin VIIa antibodies that were incubated for 48–72 hr. The following primary antibodies were used: mouse anti-BrdU [1:300, RRID:AB_400326, BD Biosciences (San Jose, CA), #347580]; rabbit anti-calbindin [1:200, RRID:AB_2068336, EMD Millipore (Billerica, MA), #AB1778]; rabbit anti-calretinin [1:100, RRID:AB_2068506, EMD Millipore (Billerica, MA), #AB5054]; rabbit anti-aCasp3 [1:200, RRID:AB_397274, BD Biosciences (San Jose, CA), #559565]; rat anti-CD68 [1:100, RRID:AB_566872, AbD Serotec (Raleigh, NC), #MCA A341GA]; rabbit anti-espin [1:500, RRID:AB_2630385, gift from Dr. Stefan Heller, Stanford University]; rabbit anti-GFP [1:250, RRID:AB_221570, Invitrogen (Carlsbad, CA), #A6455]; rabbit anti-IBA1 [1:1000, RRID:AB_839505, Wako Pure Chemical Industries, LLC (Richmond, VA), #019–19741]; mouse anti-myosin VIIa [1:100, RRID:AB_2282417, Developmental Studies Hybridoma Bank (Iowa City, IA), #138–1]; rabbit anti-myosin VIIa [1:100, RRID:AB_2314839, Proteus Biosciences, Inc. (Ramona, CA), #25–6790]; rabbit anti-PMCA2 [1:1000, RRID:AB_2630386, gift from Dr. Peter Barr-Gillespie, Oregon Health Sciences University]; mouse anti-POU4F3 [1:500, RRID:AB_2167543, Santa Cruz Biotechnology, Inc. (Dallas, TX), #sc-81980]; rabbit anti-PCDH15-CD2 [1:200, RRID:AB_2630387, gift from Drs. Tom Friedman (National Institutes of Health) and Zubair Ahmed (University of Maryland)]; goat anti-SOX2 [1:200, RRID:AB_2286684. Santa Cruz Biotechnology, Inc. (Dallas, TX), #sc-17320]; and rabbit anti-tenascin [1:100, RRID:AB_2256033, EMD Millipore (Billerica, MA), #AB19013]. After rinsing thrice with 1X PBS, utricles were incubated with Alexa Flour-conjugated secondary antibodies [1:400 in blocking buffer, Invitrogen (Carlsbad, CA)] for 2 hr at room temperature. Utricles were then incubated with Alexa Flour-conjugated phalloidin [1:100, RRID:AB_2620155 or RRID:AB_2315147, Invitrogen (Carlsbad, CA), #A12379 or #A22287] in 1X PBS for 30 min followed by a second 30 min incubation in DAPI (Sigma-Aldrich, St. Louis, MO) at 1 µg/ml in 1X PBS. After rinsing thrice in 1X PBS, whole utricles were mounted in Fluoromount-G (Southern Biotech, Birmingham, AL) between two cover slips anchored to a glass slide with putty. To detect apoptosis in whole utricles and gut tissue (positive control), we utilized the ApopTag Fluorescein In Situ Apoptosis Detection Kit [#S7110, Chemicon (now EMD Millipore, Billerica, MA)] according to the manufacturer’s instructions followed by immunostaining as described above. To detect proliferating cells in whole utricles and gut tissue (positive control) from mice treated with BrdU, fixed tissue was first labeled with antibodies for cell specific markers as described above. After secondary antibody incubation, tissue was fixed again in 4% paraformaldehyde for 20 min at room temperature. After rinsing in 1X PBS and a second permeabilization step, the tissue was incubated in 2 N HCl in 0.05% Triton X-100 for 1 hr at room temperature, then rinsed in 1X PBS, and placed in blocking buffer for 30 min. Then the tissue was immunostained with anti-BrdU primary antibodies as described above. Fluorescent images were obtained with an Olympus FV-1000 microscope (Olympus, Center Valley, PA). In most cases, z-series images were collected with a 60x oil objective through the entire macula, from above stereocilia bundles to the stroma below the basal lamina, at 0.5 or 0.25 µm increments. For qualitative analyses, we generated z-series in 2–3 extrastriolar and striolar regions. For quantitative analysis for Figures 3, 5, 6, 7, 8 and 9, we generated high-resolution images or montages of the entire utricular macula. Image analysis was performed using Fiji (http://fiji.sc/). Fiji’s Cell Counter plugin was used for quantitative analyses. To determine the percentage of SCs labeled in Plp1-CreERT2:ROSA26tdTomato mice one week after tamoxifen injection, eight 50 × 50 µm regions of each utricle (3 in the medial extrastriola, 3 in the lateral extrastriola, and two in the striolar area) were sampled. All SCs within the sampled regions were counted and scored as tdTomato-positive or tdTomato-negative. The average percentage of extrastriolar SCs that were tdTomato-labeled was calculated by combining medial and lateral extrastriolar regions. To assess whether phalloidin-labeled phagosomes co-localized with IBA1 immunolabeling, 301 phalloidin-labeled phagosomes from 6 Swiss Webster mice at 9 weeks of age were closely examined. To quantify PCDH15-CD2-labeled stereocilia bundles in adult CBA/CaJ and Swiss Webster mice, the 100x oil objective on the Olympus FV-1000 confocal microscope was used. The observer looked over the entire utricle and counted phalloidin-labeled stereocilia bundles co-localized with multiple puncta of PCDH15-CD2 along the length and width of the bundle. The Cell Counter plugin in Fiji was used to mark tdTomato-labeled HCs in one utricle from an adult Plp1-CreERT2:ROSA26tdTomato mouse (Figure 6F). Results were imported into Microsoft Powerpoint 2011 (Microsoft, Redmond, WA) to assemble the images and reconstruct an entire utricle. The file was imported into Adobe Photoshop CS 4 (Adobe, San Jose, CA), where an outline was drawn around the whole utricle and dots were drawn directly over the Cell Counter labels to create the maps of tdTomato-labeled HCs. To generate the map of PCDH15-CD2-labeled bundles (Figure 5C), an adult Swiss Webster utricle was scanned at high magnification using confocal microscopy, and the position of each PCDH15-CD2-labeled bundle was noted for each field on a grid. The utricle was reconstructed using Adobe Photoshop CS 4. Data were analyzed using Graphpad Prism 5.0 (Graphpad Software, La Jolla, CA) or SAS 9.4 (Cary, NC). All data are reported as mean ±1 standard deviation. 95% confidence intervals were calculated with Microsoft Excel 2011 (Microsoft, Redmond, WA). For all studies, one utricle per animal was assessed and the ‘n’ value represents the number of mice included in the study, unless otherwise noted. n’s for each data set are included in the Results section, source data tables, and/or the Figure Legends. Archives of Internal Medicine 169:938–944. Journal of the Neurological Sciences 75:113–119. Transactions. Section on Otolaryngology. American Academy of Ophthalmology and Otolaryngology 82:ORL50–59. Trends in Biochemical Sciences 37:325–332. Journal of the Association for Research in Otolaryngology 13:609–627. Fish N' chicks: model recipes for hair-cell regeneration? Annual Review of Neuroscience 34:501–534. The Journal of Comparative Neurology 397:69–88. Journal of the Association for Research in Otolaryngology 11:19–26. The Journal of Biological Chemistry 268:9661–9666. Frontiers in Cellular Neuroscience 9:150. Journal of Comparative Neurology 438:433–444. The Journal of Comparative Neurology 492:132–144. The Journal of Comparative Neurology 399:413–423. The American Journal of Otology 18:637–643. Journal of the Association for Research in Otolaryngology 1:161–171. The Journal of Comparative Neurology 468:125–134. International Journal of Developmental Neuroscience 15:433–446. The Journal of Comparative Neurology 355:405–417. Journal of the Association for Research in Otolaryngology 12:173–183. Cell Death and Differentiation 22:1995–2005. Biochimica et Biophysica Acta (BBA) - Molecular Cell Research 1833:3448–3459. Journal of Comparative Neurology 522:3141–3159. The Journal of Comparative Neurology 206:1–8. Trends in Developmental Biology 7:73–89. The International Journal of Developmental Biology 51:633–647. Seminars in Cell & Developmental Biology 24:448–459. The Journal of Comparative Neurology 331:97–110. Cold Spring Harbor Symposia on Quantitative Biology 62:325–336. Thank you for submitting your article "Supporting cells remove and replace sensory receptor hair cells in a balance organ of adult mice" for consideration by eLife. Your article has been reviewed by 3 peer reviewers, and the evaluation has been overseen by a Tanya Whitfield as the Reviewing Editor and Sean Morrison as the Senior Editor. The following individuals involved in review of your submission have agreed to reveal their identity: Yehoash Raphael (Reviewer #2) and Jonathan Gale (Reviewer #3). This paper demonstrates that a slow endogenous turnover of vestibular hair cells in the utricle of adult mice occurs in the absence of overt hair cell damage, via phagocytosis, apparently by supporting cells. The paper also demonstrates that the mammalian vestibular system can regenerate Type II vestibular hair cells through phenotypic conversion of supporting cells. Overall, it was agreed that the study communicated a number of significant and important new findings and would be of general interest. However, there were several concerns that should be addressed before publication. The following numbered points were felt to be the essential changes required; the full reviews are appended below for further information. 1) Two of the reviewers query whether the rate of hair cell turnover in the Swiss-Webster mice is specific to that strain. Further information and discussion is required here. 2) Given the known phagocytic activity of Schwann cells, and the position and labelling of Schwann cells in the utricle, please provide further data, if possible, to address the possibility that the phagosomes are Schwann cell-derived (see comments from reviewer 1). As a minimum, further discussion is required to address this point. At present, Schwann cells are discussed as a possible source of hair cells, but not of phagosomes, in the manuscript. 3) As requested by reviewer 2, please remove the word 'undamaged' when referring to normal turnover of hair cells and discuss the possibility that such turnover may replace cells that are damaged in some way by normal wear and tear. 4) As requested by reviewer 2, please provide further data and discussion to compare the role of supporting cells in clearing damaged hair cells after diphtheria toxin lesion with their role in normal turnover. 5) Please review the statistical analysis of the data carefully (see comments from reviewer 2). 6) It was felt that the last paragraph of the Discussion makes an abrupt end to the manuscript and does not tie the story together well. Please aim to rewrite this, in particular to include a clear discussion of the physiological significance of the findings. 7) After discussion, it was felt that answering the interesting questions raised by reviewer 1 concerning mechanistic insights would be beyond the scope of this study; therefore, it is not essential to address these with further experimental work. However, if the authors have further discussion to add here, this would help to address these concerns. The manuscript by Bucks et al. explores important issues, i.e. the ability of the mammalian inner ear to replace hair cells and the mechanisms by which this might occur. The study reports that hair cells in the adult mammalian utricle undergo removal and replacement by their surrounding supporting cells under both normal and damaging condition. The authors performed thorough analysis characterizing three individual mouse strains and using lineage tracing experiments to confirm the cellular origin of replaced hair cells. The manuscript is clear and technically sound. However, there are major issues regarding to the general interest of this study and the physiological significance of the findings. Novelty: the paper refers to previous studies that showed the ability of adult rodents to regenerate small numbers of utricular HCs after ototoxin-induced damage. Was the magnitude of the regeneration in those studies much lower than in the current study? Since in this paper the authors show that the degree of cell replacement differs between mouse strains, are the present results more dramatic because the specific strain studies here? The authors need to discuss if the high degree of cell replacement seen in Swiss Webster mice is an anomaly given that replacement occurs at a much lower degree in the other strains. The paper also refers to previous studies showing that supporting cells phagocytose hair cells after ototoxic damage in and mammals, and there have been reports of vestibular hair cell loss in the adult ear. Thus, it seems that this study just provides further evidence of the hair cell phagocytic capacity of supporting cells in the normal tissue. Biological-physiological relevance: Although this study provides solid evidence of hair cell replacement in adult utricle, primarily by transdifferentiation of supporting cells, it remains unclear if 36.6 cells replaced per utricle at 15 wk post tamoxifen (Figure 5E), which would translate into about 317 in 2.5 years, the lifespan of a mouse is biologically significant. This number of hair cells, if I'm not mistaken, represents a very small% of total hair cells in the utricle, making me wonder what is the physiological relevance of these findings. Furthermore, the number of cells replaced is much lower in several strains, further questioning the functional impact of such process. Does this percentage increase over a longer period of time? Are these tdTomato-traced cells functional? The replaced hair cells typically have shorter stereocilia bundles, how does this affect hair cell function? Do the replaced hair cells form ribbon synapses with vestibular ganglion terminals? 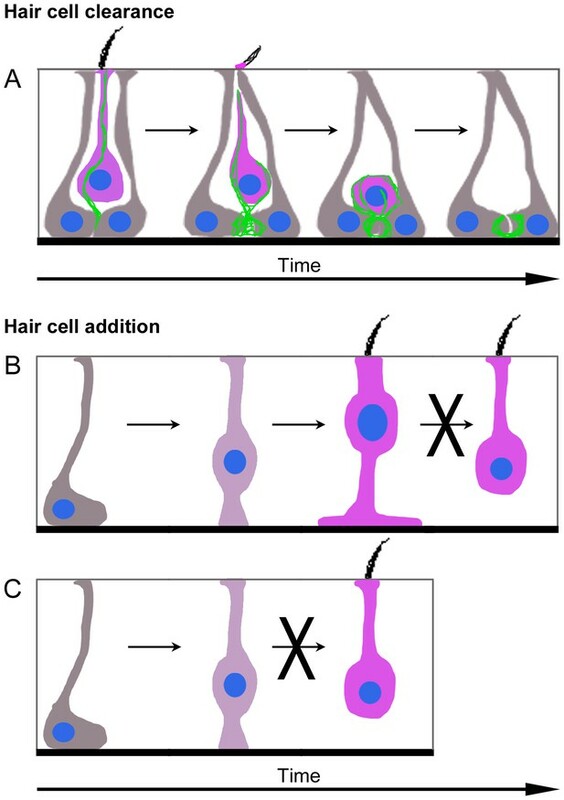 Mechanistic insights: Conversion of supporting cells to hair cells appears to be a critical pathway for hair cell regeneration, however, the mechanistic details are lacking for this study to be sufficiently novel and of general importance. 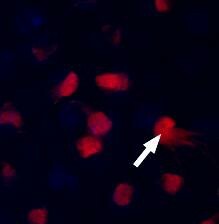 For example, what is the signal that triggers the supporting cell transdifferentiation? How does loss of supporting cells (by conversion to hair cells) affect vestibular function? How are the vestibular ganglion processes remodeled during hair cells loss and replacement? In the 6th paragraph of the subsection “Type I and II HCs are cleared by phagosomes from adult mouse utricles under normal conditions”: the authors report that in 5-10 week-old Swiss Webster mice, 71.7% of the on average 48 phagosomes per utricle are not hair cells, leaving the reader wondering what is the most intense phagosome activity in the utricle related to? The paper shows SCs phagocytose both type I and II HCs, but only generate type II HC. Does the number of type I HCs decrease with age in the undamaged utricle? Although several morphological criteria are used to classify HCs as type I or type II in utricle whole-mounts, use of specific antibodies, as in Figure 1I–K, would be necessary to make a compelling case. As shown by the authors, in Plp-CreERT2:ROSA26tdTomato mice, some Schwann cells in the stroma and cells in the region of transitional epithelium are also tdTomato-positive. Since F-actin enriched phagosomes are found in the SC nuclear layer, which is adjacent to the basal lamina and stroma, it could be a possibility that phagosomes are derived from Schwann cells. And phagosomes in the region near the transitional epithelium (as shown in Figure 2A–A') may be derived from cells in the transitional epithelium. These possibilities should be considered in the Discussion. Figure 4A–B: it would be helpful is the authors would explain what is the PCDH15-CD12 signal in the adult (Figure 4B). The last paragraph of the Discussion section does not flow with the rest of the text, seems misplaced. This is an elegant paper reporting findings related to hair cell elimination and spontaneous regeneration in the vestibular epithelium. This timing may be correct for mice but not necessarily all mammals. Rephrase please. "Supporting cells (SCs) are glia-like cells". Also: "SCs, which resemble glia". SCs are epithelial cells. True, they have some functions and some molecular properties shared with glia, but the definition "glial-like" may not be accurate. Previous studies, including from the Seattle group, claimed that SCs are ejected from the sensory epithelium when eliminated by an insult. How do the current results conform to these findings? Please discuss to explain this. When SCs clear HCs after ototoxin-mediated injury, they first produce an actin cable to constrict the HC. This was shown by Meiteles in 1994 (PMID: 7528737). Add citation. Assessment of the role of SCs in the death of HCs is presented in details as related to turnover, but not described for the DT lesion in the DTR mice, where it is even more important. Add data and discuss differences between turnover and response to trauma. Figure 1C should indicate surface view more clearly. Could dispense with this image because all micrographs are at supporting cell level. A schematic at the level of SCs, would be more useful to add or replace. Figure 1D legend: "In most panels…" should state here how the other panels are labeled. The actin rod was first described by Sobin and later termed cytocaud by Kanzaki upon further characterization. Better citations would help. Cytocauds are compatible with survival of HCs for weeks or longer, yet they are clearly manifestations of stress and onset of degeneration. Therefore, their presence is not necessarily related to the mode of HC elimination. Figure 1E' is the merge? There seems to be more myosin at this level than in just the 4 areas attributed to ectopic HCs. What is "brightest point projection image"? Addition of a neuronal marker for calyces would help reader to distinguish type I from type II HCs. What is "basket-shape"? Baskets come in wide variety of shapes. A more specific geometric term should be used. It was not clear what the background of plp cre was, and whether Swiss Webster, CBA or c57b6 was the closest comparison. I would suggest not using the term "undamaged". An agent may not have been used to intentionally induce a lesion, but one cannot rule out the possibility that the cells targeted for phagocytosis are not damaged. It may be normal wear and tear but it is still damage. In the second paragraph of the subsection “Immature HCs are present in undamaged utricles of adult mice”: larger format images similar to Figure 4D should be used to show the difference between ages in localization pcdh15 isoforms across utricular regions. This would be better support for the comparison to the distribution of atoh1. Figure 5 and 6 – aren't these addressing the same or at least overlapping questions? Type I HCs don't increase so they are not being generated by either proposed mechanism. In the last paragraph of the subsection “Atoh1-CreERTM-labeled type II HCs did not convert into type I HCs under normal conditions”: Statistics on proportion is problematic because proportions are ratios, which are not normally distributed. They also do not address the potential interdependence of the numerator and denominator. A test for correlation between counts would be better – i.e. does slope differ between time points. Also, if the numerator and denominator are not truly dependent and independent, you might consider reduced major axis regression. It also seems like the data in Figure 5 might suffice to answer this. No need to include both sd and ci; one can be calculated from the other. Sample sizes are too small to justify a test assuming unequal variances; it may seem obvious that 11x difference in variances would be significant, but these sample sizes are too small for credible comparisons of variances, and it is not possible to know if they represent normal distributions. In this paper the authors investigate the mechanisms of sensory hair cell turnover in the mammalian vestibular system. Understanding these mechanisms is important if we are to fully understand how to regenerate sensory hair cells in humans. Firstly, the authors describe finding actin-rich structures that are closely associated with hair-bundle less hair cells underneath the utricular epithelial surface close to the basal lamina. These structures were found in fixed specimens of control mice (of various strains). There are a small number of these in a single sense organ at any one time (ranging from 10 to 60 depending on the strain but independent upon the age of the mouse). They are somewhat regionally restricted, being found predominantly in the peri-striolar region. The paper is a great example of what can be done using different mouse models and different cellular markers. The work is high quality and is well presented. The paper gives us an important insight into the life and death of hair cells in the mammalian utricle under "normal" conditions and shows the importance of the supporting cells in that life and death. 1) The data presented suggest during normal ageing a small number of hair cells are removed from the epithelial surface and become associated with the actin-rich phagosomal structures described in the paper. It is not clear to me from the data presented whether the phagocytic process that is suggested in Figures 1 and 2 is any different from the mechanisms that have been described and shown directly through live-imaging in both the avian and mammalian utricle. It seems very possible that the same process that has been described for ototoxically damage cells could be responsible for the removal of the cells described here. Is there any reason not to conclude that a similar process is used? This points warrants further discussion (note – see point 12 below)? 2) There is a description of "association" between phagosomes and hair cells e.g. subsection “Type I and II HCs are cleared by phagosomes from adult mouse utricles under normal conditions”, third paragraph, fourth and sixth paragraphs. A qualification of what constituted such "associations" and how there were determined by the observer is required. Does this association mean that there was clear evidence of engulfment of a hair cell within a phagosome? 3) In order to call this structure a phagosome there needs to be better description of how the actin rich structures that are shown are linked to the supporting cells that presumably generated them – this is hard to see this from the images provided. Have the authors for example tried to reconstruct the phagosome structure in 3D from the confocal stacks they have? 4) Is there something unusual about Swiss Webster mice? They have ~3x as many of the actin rich structures as the other two strains? 5) The phagosome-like structures are somewhat regionally restricted, being found predominantly in the peri-striolar region. There is little discussion of why this might be the case. 6) Can the authors estimate the lifetime of the actin-rich phagosomal structures they describe (see note 12 below)? 7) How much actin is there in these structures compared to the actin-rich hair bundles of the normal hair cells? How about the spikes – the sequence showing the stack (Video 2) suggests very similar levels? 8) How are the estimations for the% of Type I and Type II hair cells made (subsection “Atoh1-CreERTM-labeled type II HCs did not convert into type I HCs under normal conditions”, first paragraph)? I estimated 3% and 35% respectively using the numbers of tdTom labelled hair cells shown in the table for 7 weeks of age, a total hair cell number of 3600 and a ratio of 1.17:1. 9) At the end of the subsection “Diphtheria toxin-induced HC ablation increased SC-to-type II HC transition in adult mouse utricles” – it is stated that the rate of transdifferentiation is significantly increased. The data indicates that this is what happens but no rates are provided per se. Consider revising the sentence? 10) The finding that only Type II hair cells are replaced in the mammal has implications for the recovery of function since the Type I cells provide/send different information to brain. Does this finding concur with what is known/has been shown for the functional recovery that has been described in other work? 11) The authors show in fate mapping experiments that ~2 hair cells are added per week. If we assume that the utricle maintains its normal number of cells over this period (which is thought to be the case) then the rate of removal should be the same. Even if the fate-mapping studies are not 100% effective and we assume a 75% efficacy then the simplest estimation is that there would be~3 (or just under) hair cells turned over per week, rather than the 10 suggested at the end of the subsection “Estimates of the rate of HCs turnover in adult mice”. Using this estimate we can see that the phagocytic structures that are described here is a somewhat long lived with lifetimes >1 week, indicating some differences to those phagosomes already described by others. Other comments:i) Subsection “Type I and II HCs are cleared by phagosomes from adult mouse utricles under normal conditions”, fourth paragraph: How do the authors know that this is a calyceal afferent from the image shown in Panel 1F? This is quite hard to see and a marker would be required for definitive evidence. The tenascin data shown in Figure 1K,K' and K' provide some support for this although it is not entirely clear that the tenascin is within the actin-rich structure. Again – could some 3D reconstruction help? ii) Fig1L – it is hard to make out where the epithelial surface is perhaps this can be clarified. iii) Figure 2 – clarify that this is a projection of the lower planes of the utricle – if it was a max projection of the full stack you would see mostly hair bundles in the image wouldn't you? iv) Figure 4A and B – is the edge of the sensory macula in the field of view or is it an oblique optical section in both cases? v) I found Figure 5B–C hard to see due to the merging of the colours. It is clear that in C' there is a tdTom-positive and Myo7a-positive double labelled cell. Why does this cell have such a strong Myo7a signal – is this typical? […] Overall, it was agreed that the study communicated a number of significant and important new findings and would be of general interest. However, there were several concerns that should be addressed before publication. The following numbered points were felt to be the essential changes required; the full reviews are appended below for further information. This is an excellent question. After conducting an extensive literature search, the only notable Swiss Webster phenotype we found was two reports describing Swiss Webster mice exhibiting circling behavior and inflammation in vestibular organs caused by infection with Pseudomonas aeruginosa (Ediger et al., 1971 Lab Anim Sci; Olson and Ediger, 1972 Lab Anim Sci). We have not observed circling behavior in our Swiss Webster mice, and no evidence of vestibular macular inflammation or damage was detected during our analyses of their utricles. To date, there is very little known to form a clear hypothesis as to why Swiss Webster mice have seemingly increased HC turnover compared to other strains in our study. It is important to note, however, that while our findings describe significantly more phagosomes in Swiss Webster mouse utricles, there was no significant increase in protocadherin15-CD2 labeled stereocilia bundles compared to other strains. Assuming that there is a balance between HC clearance and HC addition, the actin dynamics and, consequently, kinetics of creating and resolving phagosomes may be longer in Swiss Webster mice. Live-imaging studies of HC turnover in utricles from Swiss Webster and other mouse strains could help clarify this. We have added the several sentences to the Discussion for this point (subsection “Significance of vestibular HC turnover in adult mice”, second paragraph). This is an important question. Unfortunately, despite considerable effort, we were not able to find antibodies that label Schwann cells but not SCs or evidence of CreER mouse lines that target Schwann cells specifically. This is also true for cells in the transitional epithelium (TE). Thus, new tools are needed to delineate what, if any, contribution Schwann cells or TE cells make to the production of phagosomes and the addition of HCs in the normal utricle. However, we have included new data to further support the interpretation that many phagosomes derive from SCs. The Lfng-eGFP mouse expresses eGFP specifically in SCs in vestibular epithelia, but not in Schwann cells or TE cells (see revised Figure 4H and Burns et al., 2015 Nat Comm). In Lfng-eGFP mice, eGFP is expressed in the majority of SCs, and we observed co-localization of eGFP with F-actin rich phagosomes. This supports our findings using Plp1-CreERT2:ROSA26tdTomato mice that SCs can act as phagosomes. We have included these new data in Figure 4H–I” and in Results (subsection “SCs clear HCs from adult mouse utricles under normal conditions”, second paragraph) and Materials and methods (subsection “Mouse models"). In addition, we have expanded the Discussion to include the possibility that Schwann cells could also act as phagocytes and that new tools are needed to investigate this idea (subsection “Phagocytosis by SCs mediates HC clearance in normal mouse utricles”, first paragraph). However, it is unlikely that TE cells are sources of phagosomes, since the majority of phagosomes we observed were located in the central region of the macula, away from the transitional epithelium. This point was also added to the Discussion (see the aforementioned paragraph). Thank you for this suggestion, which clarifies the study design for the reader. We replaced the term “undamaged” with “normal” throughout the text, including section headings and figure legends. For discussion of the Plp1-CreERT2:ROSA26tdTomato:Pou4f3DTR mouse experiments, the term “undamaged” was replaced with “control”. We also added a sentence to the Discussion to acknowledge that normal wear and tear may cause HC damage and induce phagocytosis (subsection “Phagocytosis by SCs mediates HC clearance in normal mouse utricles”, last paragraph). We counted phagosomes in Pou4f3DTR mice and created a new figure (Figure 9), which shows a ~60% increase in the number of phagosomes at 4 and 7 days post DT-induced damage, but not at other time points post DT. Our previous work showed a loss of >2000 HCs over the first week post-DT (Golub et al., 2012), so the increase of phagosomes we observed (~5 per utricle) in this time is much less than the thousands of HCs that need to be cleared. Kaur et al. (2015) described macrophage infiltration in DT-treated mouse utricles to clear HC debris, and these macrophages did not overlap with the F-actin-rich phagosome structures that we attribute to SCs. Thus, it is likely that SCs form phagosomes for normal HC turnover and minimally increase their phagocytic activity after damage. We also found that phagosomes in Pou4f3DTR mice were located in the normal HC layer, which contrasts with the basal location of phagosomes in normal utricles in the SC nuclear layer. 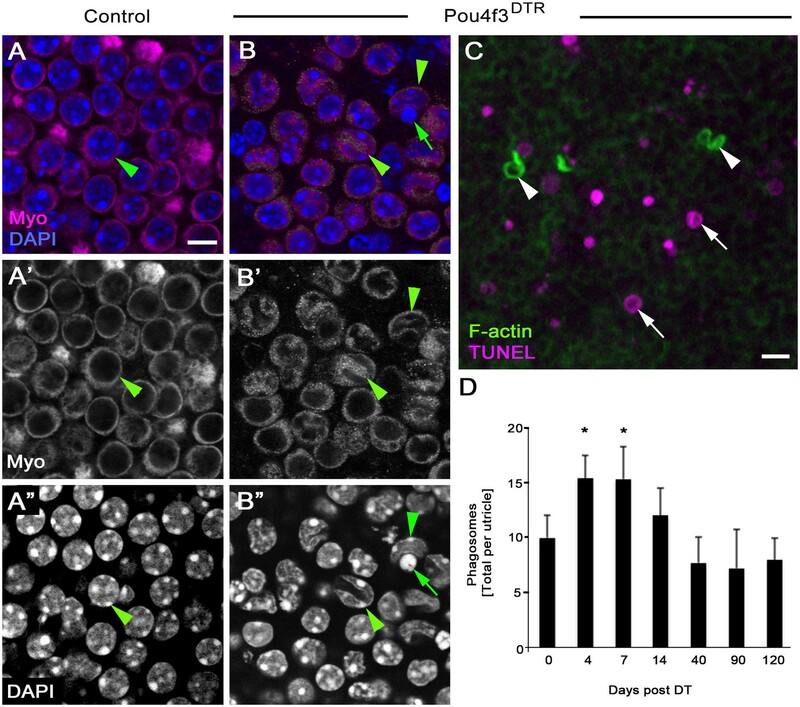 In addition, some HCs in Pou4f3DTR mice co-localized with TUNEL or had apoptotic features in their nuclei, but these cells with apoptotic features were not associated with phagosomes. This contrasts with normal utricles, in which HCs associated with phagosomes had normal chromatin and no signs of apoptosis. We added these points to the Results (subsection “SCs play a minor role in the clearance of dying HCs after DT-induced damage”) and created a new Figure 9. In the Discussion, we compared phagocytosis between normal and HC damaged conditions (subsection “Phagocytosis by SCs mediates HC clearance in normal mouse utricles”, second and third paragraphs). We consulted with a statistician and made changes to the statistical analyses in question. A specific response to these comments from reviewer 2 is presented below (see our seventeenth response to review 2). We have rewritten the last 3 paragraphs of the Discussion to address multiple reviewer comments. In addition to making estimates for how many HCs are turned over in a mouse’s lifetime, we conclude with a discussion for the possible functional significance of our findings. Specifically, we found evidence that type I HC are cleared, but no evidence that type I HCs are replaced. A progressive loss of type I HCs over time or disruption in the balance of type II HC clearance and addition, for example during aging, could result in vestibular dysfunction and balance disorders such as vertigo. Previous studies on HC numbers in aged mouse utricles and vestibular dysfunction during aging were also discussed (subsection “Significance of vestibular HC turnover in adult mice”). We agree that the mechanism of HC clearance and addition is very important to understand and are currently designing studies to address these questions. In the Discussion, we expanded the paragraph focused on why HCs are targeted for clearance suggesting damage caused by normal “wear and tear,” changes in innervation or cell membrane integrity, or even that SCs act as primary phagocytes (subsection “Phagocytosis by SCs mediates HC clearance in normal mouse utricles”, last paragraph). We also added a new paragraph to compare the mechanism of phagocytosis in normal versus HC damaged utricles as well as the cell types involved in each circumstance (subsection “Phagocytosis by SCs mediates HC clearance in normal mouse utricles”, third paragraph). We believe that there is confusion here between HC regeneration (which occurs after HC damage) and HC addition (which occurs under normal, physiological conditions). Previous studies have quantified HC regeneration in vestibular organs, but our manuscript is the first to definitively demonstrate and quantify HC addition in normal, adult utricles. While comparison of these quantifications is informative, they occur in two distinct environments and are not expected to result in the same number of added HCs. Also in our Figure 8, which quantifies the amount of HC regeneration in Pou4f3DTR mice, we only counted the tdTomato-positive HCs fate-mapped by Plp1-CreERT2:ROSA26tdTomatomice. This is likely an underestimate of total HC regeneration reported in previous studies since not all SCs are labeled by tdTomato in these mice. For Swiss Webster mice, our findings describe significantly more phagosomes for HC clearance, but there was no significant difference in protocadherin15-CD2 labeled stereocilia bundles (labeling immature HCs) compared to another strain. Thus, we do not have evidence that there is an increase in HC addition in Swiss Webster mice. As explained in Essential Comment #1, we expanded the Discussion to address Swiss Webster’s relatively high numbers of phagosomes (subsection “Significance of vestibular HC turnover in adult mice”, second paragraph). While several studies have demonstrated SCs act as phagocytes after HC are damaged (by noise, ototoxins, etc. ), there are no previous studies which demonstrate that SCs phagocytose HCs in normal utricles. In addition, the reports of HC loss are from the aged ear and our study is focused on young adult mice. There are no reports of HC loss in utricles of young normal mice. Therefore, our findings suggest a previously unknown role of SCs as phagocytes of type I and II vestibular HCs under normal conditions. These are excellent points. We modified the end of the Discussion to address the functional significance of our findings (see Essential Comment #6). 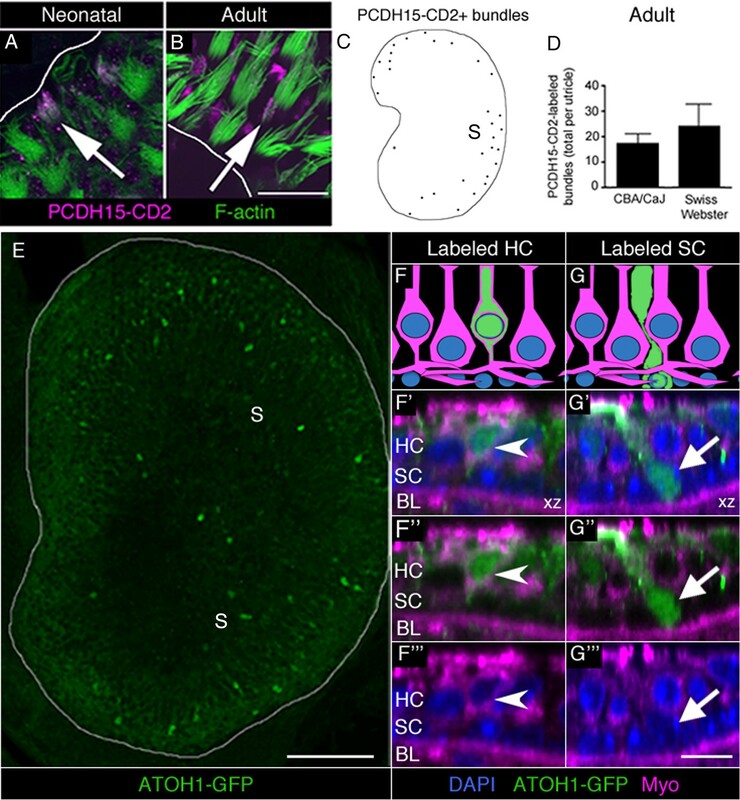 In addition, we explain in the Discussion (subsection “Significance of vestibular HC turnover in adult mice”, first paragraph) that our quantification of HC addition is likely an underestimate since not all SCs were fate-mapped and other cells (such as cells in the transitional epithelium) may also convert into HCs in the normal utricle. As explained in our first response to reviewer 1, we do not have evidence that there is an increase in HC addition in Swiss Webster mice. Our data only show an increase in the number of phagosomes in Swiss Webster mice, which could be caused by strain-differences in actin dynamics and lifespan of the phagosomes. Additionally, new HCs share many features with neighboring mature type II HCs, including myosin VIIA immunoreactivity, properly positioned nuclei, proper relative neck thicknesses, well defined stereocilia bundles, and basolateral processes. However, since we could not birth-date HCs in this study, we were not able to determine the degree to which new type II HCs are mature. Further, we did not perform any analyses that would inform on the functional status of the new HCs. Therefore, additional work is required to assess if HCs replaced in adult animals under normal conditions or after damage are functionally mature. These points were added to the Discussion (subsection “SCs transdifferentiate into type II HCs in normal mouse utricles”, fourth paragraph). We agree that mechanisms of HC clearance and addition are very important to understand, and we are designing studies to address these questions. However, we agree with Essential Comment #7 that definition of mechanisms is beyond the scope of this initial report. In the sixth paragraph of the subsection “Type I and II HCs are cleared by phagosomes from adult mouse utricles under normal conditions”: the authors report that in 5-10 week-old Swiss Webster mice, 71.7% of the on average 48 phagosomes per utricle are not hair cells, leaving the reader wondering what is the most intense phagosome activity in the utricle related to? This is a great question. We suspect the phagosomes that are not associated with HCs are empty phagosomes that have already finished HC engulfment and HC markers such as myosin VIIa are no longer detectable by immunostaining. These empty phagosomes are likely lingering in the sensory epithelium before they are slowly resorbed as was described in aminoglycoside-treated adult mouse utricles by Monzack et al., 2015. To address your question, future live imaging studies are needed. We revised the Results (subsection “Type I and II HCs are cleared by phagosomes from adult mouse utricles under normal conditions”, fourth paragraph) to address this point. There are conflicting data on this point. In aged C57Bl/6NNia mice, Park et al. (1987) found a ~14% reduction in both type I and II HCs. However, Kirkegaard and Nyangaard (2005) found no evidence of HC loss in aged outbred mice for either HC type. We included these references and added more information for consequences of the possible loss of type I HCs in the Discussion (subsection “Significance of vestibular HC turnover in adult mice”, last paragraph). Further, we were concerned that increasing the number of labels per utricle from 3 (DAPI, Myo7a, tdTomato) to 4 or 5 (DAPI, Myo7a, tdTomato, markers of type I and II HCs) would diminish the quality of immunolabeling and the reliability of analysis, while not providing much extra power in cellular identification. Please see our response above to Essential Comment #2. Thank you for this suggestion. We clarified PCDH15-CD2 labeling in the revised figure legend text for this figure (now Figure 5B). Great point. We rewrote the final 3 paragraphs of the Discussion. See Essential Comment #6. "In mammals, vestibular HC production is reported to occur only during gestation and the first two postnatal weeks…"
Thank you. We made this correction (Introduction, second paragraph). epithelial in origin but have properties of glial cells (Introduction, third paragraph and subsection “Phagocytosis by SCs mediates HC clearance in normal mouse utricles”, first paragraph). To the best of our knowledge there is no evidence that SCs are ejected from the epithelium. Perhaps this is a typo? After utricular HC damage by aminoglycosides, others have reported that the apical portion of the HC is cleaved and ejected but the cell body degenerates within the epithelium (Li et al., 1995; Bird et al., 2010; Monzack et al., 2015). To determine if the apical portion of HCs are also ejected under normal conditions, we acquired new data where normal utricles were labeled with antibodies to espin and PMCA2, which label stereocilia but not other structures in the sensory epithelium (Dumont et al., 2001; Li et al., 2004). While we detected bright labeling with each antibody in stereocilia, none of the HCs associated with phagosomes contained brightly labeled foci resembling stereocilia. This finding suggests that the apical part of the HC is ejected apically prior to translocation or that stereocilia degenerate during translocation, during normal clearance. Interestingly, espin antibodies did label the actin-rich spikes. Initially, we thought this could indicate the spike is derived from stereocilia. However, spikes were not labeled for antibodies to PMCA2, suggesting that this is not the case. We have added new images to Figure 2 (panels 2C-D”) and new text in the Results (subsection “Type I and II HCs are cleared by phagosomes from adult mouse utricles under normal conditions”, eighth paragraph) and Discussion (subsection “Phagocytosis by SCs mediates HC clearance in normal mouse utricles”, second paragraph). Thank you for this reminder. We added this reference, as suggested. This is an excellent point, which we addressed above, in Essential Comment #4. Thank you for this comment. In the figure and the figure legend, we clarified that Figure 1B,C are surface (xy) views of the utricle. We opted to keep Figure 1A–D, since they are intended as an introduction to the morphology of the utricle for readers not familiar with inner ear. Further, we feel Figure 1C is important, since we present micrographs in this orientation in several figures. However, given the frequency of the SC layer view, we modified Figure 1C to include a schematic of the SC nuclear layer as well. We edited the figure legend text to clarify the labeling of each panel (Figure 1 legend). We added references to Sobin et al., 1982 and Kanzaki et al., 2002, as well as to Flock et al., 1979 when discussing cytocauds (subsection “Phagocytosis by SCs mediates HC clearance in normal mouse utricles”, second paragraph). The suggestion that the actin spike we observed (and compared to cytocauds) is the first sign that a HC is targeted for clearance is just a hypothesis proposed in our model. As stated in this same paragraph, further studies including live imaging are needed to test the model and determine whether the actin spike is a sign of HC degeneration or if it is unrelated. We clarified that this is our hypothesis and also presented the alternative that the actin spike does not play a role in HC clearance. Figure 1E' is the merge? There seems to be more myosin at this level than in just the four areas attributed to ectopic HCs. Great point. The areas of myosin in Figure 1E not clearly associated with a HC nucleus are type II HC cytoplasmic processes. This has been revised in the figure legend, and a schematic was added to Figure 1C, right panel. We changed this term to just “projection image” to prevent confusion. As explained above (see our seventh response to reviewer 1), we used 4 robust criteria that we are confident can distinguish between type I and II HCs. When we were not sure, we defined cells as “unknown”. Monzack et al. (2015) conducted live imaging of SC phagosome activity in aminoglycoside-treated adult mouse utricles and described the structure of the phagosomes as “basket-like.” The phagosomes we observed in normal adult mouse utricles resemble their findings and so we use the term “basket-like” to maintain consistency within the field. To aid the readers in better understanding the term, we added a description of the shape the first time “basket-like” is used (subsection “Type I and II HCs are cleared by phagosomes from adult mouse utricles under normal conditions”, third and fourth paragraphs) and a new video file that rotates a 3D reconstruction of a basket-like phagosome with a spike piercing a HC (Video 1). Plp1-CreERT2 mice are on a mixed background. The background of all mouse strains used was updated in Materials and methods (subsection “Mouse models”). Great suggestion. We altered this terminology. See Essential Comment #3 above. Unfortunately, lower magnification images of the PCDH15-CD2 labeling in a utricle are not helpful to show the distribution of HCs with short bundles, since individual bundles are obscured by long type I HC bundles and co-localization of the label with stereocilia is only defined clearly upon examination at high magnification. We addressed this question by constructing a map based of PCDH15-CD2-positive bundles using 100X images of the whole utricle (see new Figure 5C). Figure 5 and 6– aren't these addressing the same or at least overlapping questions? Type I HCs don't increase so they are not being generated by either proposed mechanism. Data in Figure 5 (now Figure 6) were generated using Plp1-CreERT2:ROSA26tdTomato mice, which labeled most SCs and allowed us to find HCs that were directly produced by tdTomato-labeled SCs at later time points after tamoxifen injection. Data in Figure 6 (now Figure 7) were generated with a different CreER line. Here we used Atoh1-CreERTM:ROSA26tdTomato mice, which labeled ~ 40% of type II HCs, allowing us to address whether type II HCs convert into type I HCs over time. With experiments presented in Figure 5, we asked “do SCs give rise to HCs, and if so, which type?”. Experiments presented in Figure 6 were conducted to answer the question “do some type II HCs convert into type I HCs over time?”. We deeply appreciated this comment and consulted with a statistician on the most appropriate test to analyze these data. After considerable deliberation, we selected an analysis of covariance (ANCOVA), since changes in labeled type I HCs is dependent on the number of total number of labeled cells per utricle. (In Atoh1-CreERTM:ROSA26tdTomato mice, we observed variability in the total number of tdTomato-positive cells across timepoints.) In addition, we determined that the best way to test our hypothesis (that type II HCs convert into type I HCs) was to determine whether the number of type I tdTomato-labeled HCs increased over time. A decrease in the number of type II tdTomato-labeled HCs does not necessarily mean conversion. These cells could have died or been phagocytosed. Analysis of tdTomato-labeled unknown HC counts is also not informative, since we were not able to determine their HC type. Therefore, we normalized the number of tdTomato-positive type I HCs to total labeled cells at each timepoint. By ANCOVA, there was no statistical difference between any of the timepoints, which suggests that type II HCs do not convert into type I HCs. We replaced the graph in Figure 6G (now Figure 7G) and changed the relevant text in Results (subsection “Atoh1-CreERTM-labeled type II HCs did not convert into type I HCs under normal conditions”, last paragraph). In addition, we added a new, later timepoint of 32 weeks post-tamoxifen, to allow us to assess conversion over a longer period. eLife’s instructions request that both standard deviation and confidence intervals be reported in the manuscript. To improve the readability of the paper, most 95% confidence intervals were presented in Supplemental Tables (source data) rather than Results text. We created new Figure 5 and Figure 8 Supplemental Tables (Figure 5—source data 1 and Figure 8—source data 1), so additional 95% confidence intervals could be removed from Results. We re-analyzed the data in Figure 8F using an unpaired, two-tailed Student’s t-test and the difference between control and damaged samples remain significant. The text in the Results (subsection “Diphtheria toxin-induced HC ablation increased SC-to-type II HC transition in adult mouse utricles”, last paragraph) and Figure 8 Legend have been updated, and the use of a Welch’s correction was removed from the Materials and methods section. This is a great point. We added new data for the analysis of phagosomes after HC damage in Pou4f3DTRmice and found some differences from our observations of phagocytosis in normal utricles (see Essential Comment #4). We also obtained new data to assess whether the apical portion of HCs are ejected from the epithelium in normal utricles by labeling with antibodies to the stereocilia proteins, espin and PMCA2 (see response to reviewer 2 comment 3). Thank you for making us aware of this lack in clarity. We added new text to better define the term “association” between phagosomes and HCs as: 1) a F-actin ring-like structure that fully encircled a HC body and was connected to a basket-like structure devoid of HC material or 2) a basket-like structure with one or more F-actin-rich processes that extended laterally and either contacted nearby HCs or pierced and entered their cytoplasm (subsection “Type I and II HCs are cleared by phagosomes from adult mouse utricles under normal conditions”, fourth paragraph). We also added a new video (Video 1), which shows a 3D reconstruction of a phagosome with a F-actin spike associated with a HC. The image can be rotated about the y-axis and shows the lattice structure of the basket-like phagosome. We used two mouse lines to label SCs (Plp1-CreERT2:ROSA26tdTomatoand Lfng-eGFP – new to the revision) and found clear overlap of labeled SCs and F-actin phagosome structures (now Figure 4). As discussed above, we generated a movie of a 3D reconstruction of a basket-like phagosome with a F-actin spike piercing a HC in the SC layer (new Video 1) to help better visualize the phagosome structure. However, the mechanisms by which SCs produce F-actin phagosomes must be addressed in future experiments, using live imaging experiments or serial immuno-EM, as eluded to in the second paragraph of the subsection “Phagocytosis by SCs mediates HC clearance in normal mouse utricles” and in the second paragraph of the subsection “Significance of vestibular HC turnover in adult mice”. See Essential comment #1 above. This is a good point, which we addressed in the first paragraph of the subsection “Phagocytosis by SCs mediates HC clearance in normal mouse utricles”. We attempted to estimate the lifespan of a phagosome in the second paragraph of the subsection “Significance of vestibular HC turnover in adult mice”, using live-cell imaging data from Monzack et al. (2015). This estimate was also used in this same section to estimate how many HCs are cleared per day and per week. We observed that the intensity of stereocilia labeling by F-actin is often much greater than the F-actin labeling in phagosomes and spikes. We postulate this is because phagosomes contain less actin or their location deeper in the epithelium decreases their exposure to the AlexaFluor-conjugated phalloidin dye compared to the stereocilia at the surface. Thank you for pointing this out. We revised these estimates, using calculations below. Assuming a ratio of type I:type II of 1.17:1 (Pujol et al., 2014), then 53.92% of HCs are type I and 46.08% of HCs are type II. For 1 week post-Tam in Atoh1-CreERTM:ROSA26tdTomato mice, we reported 50.3 type I HCs were labeled and 688.5 type II HCs were labeled. We updated these numbers (2.5% and 39.3%) in the manuscript (subsection “Atoh1-CreERTM-labeled type II HCs did not convert into type I HCs under normal conditions”, first paragraph). Thank you for catching this. The term “rate” has been removed from the text, since the data were not generated with more than two timepoints. This is a good discussion point that we missed. We added new text to the Discussion to address the functional consequences that may occur if type I HCs were progressively lost over time (subsection “Significance of vestibular HC turnover in adult mice”, last paragraph). We revised our estimation for the rate of HC turnover in the discussion and made conservative estimates solely based on the fate-mapping data since other analysis (phagosome, PDCH15-CD2, and ATOH1-GFP counts) lack a temporal perspective (subsection “Significance of vestibular HC turnover in adult mice”). In addition, other cells in the organ besides SCs (i.e. cells in the TE or stroma) could provide additional new HCs and were not fate-mapped in this study. We added this point as well. We can distinguish the calyx around type I HCs in plastic sections by its electron-lucent nature. Additionally, the calyx contains several small grayish electron-dense dots that are mitochondria. Figure 1F has been modified with additional arrows to point out these features, and the corresponding figure legend text now includes this information. We also modified the Results (subsection “Type I and II HCs are cleared by phagosomes from adult mouse utricles under normal conditions”, sixth paragraph). We agree that it is challenging to see the exact localization of the tenascin labeling, but after looking at tenascin labeling in normal HCs, we are aware that any tenascin expression around a HC is indicative of type I status. Type II HCs have no tenascin immunolabeling in their vicinity. We made some edits to try to make this clearer. Figure 1L (now Figure 2A) is a slice image taken at the level of the HC nuclei. Figure 1L’ and L’’ (now Figure 2A’ and A”) are different views (yz and xz, respectively) of Figure 1L (now Figure 2A) to help the reader see that the actin spike in the HC is below the apical surface of the epithelium. Additionally, Video 3 (was Video 2) is derived from this same field and should help the reader distinguish the location of the actin relative to the top of the epithelium. We edited Figure 2's legend to indicate that Video 3 is an excellent reference for Figure 2A–A”. This is now Figure 3. We added text to the figure legend to explain that the projection image was constructed to exclude the stereocilia, which would have obstructed the view of the phagosomes in the SC layer. This is the edge of the macula, not an oblique view. We added white lines to mark the edge of the macula in Figure 4A and Figure 4B (now Figure 5A and B) and revised the figure legend accordingly. This is now Figure 6B,C. In our hands, variable immunofluorescent staining of myosin VIIa in HCs is typical in both utricles and cochlea. We added information to the figure legend pointing out that this particular HC happens to have increased staining compared to its neighbors, but is unlikely due to its being tdTomato-positive. We have also added new panels (Figure 6B’” and C””) showing myosin VIIa as a single channel. This work was supported by the National Institutes of Health (F32 DC013695 to SAB, R01 DC013771 to JSS, and P30 DC04661 to the UW Research Core Center) and the Office of Naval Research (N00014-13-1-0569 to BCC). For technical assistance, we thank Glen MacDonald, Jialin Shang, Irina Omelchenko, Linda Robinson, Brandon Warren, Connor Finkbeiner, Andrea Gavrilescu, and Caitlyn Trullinger-Dwyer from the University of Washington and Michelle Randle and Kaley Graves from Southern Illinois University School of Medicine. We thank Dr. Kristin Delfino (Southern Illinois University School of Medicine) for assistance with statistical analyses. We are grateful to Dr. Patricia White (University of Rochester) for sharing transgenic mice with the Atoh1 3’ enhancer sequence driving GFP expression (Lumpkin et al., 2003), used in our early experiments and are not discussed here, but provided early clues to the existence of utricular HC addition in normal adult mice. We thank the following colleagues for their assistance: Dr. Andrew Groves (Baylor College of Medicine) for helpful discussions and for providing Lfng-eGFP mice and Atoh1GFP mouse tissue; Dr. Peter Barr-Gillespie (Oregon Health Sciences University) for sharing PMCA2 antibodies; Drs. Thomas Friedman (National Institutes of Health) and Zubair Ahmed (University of Maryland) for sharing PDCH15-CD2 antibodies, Dr. Stefan Heller (Stanford University) for sharing espin antibodies. We are grateful to Dr. Suzanne Baker (St. Jude Children’s Research Hospital) for sharing Atoh1-CreERTM mice. We thank Dr. Edwin Rubel (University of Washington) for sharing Pou4f3DTR mice and many helpful discussions. Finally, we are very appreciative of Drs. David Raible (University of Washington) and Mark Warchol (Washington University) for discussion and comments on the manuscript. Animal experimentation: All procedures were conducted in strict accordance with recommendations in the Guide for the Care and Use of Laboratory Animals of the National Institutes of Health. All animals were handled according to approved institutional animal care and use committee (IACUC) protocols at the University of Washington and Southern Illinois University School of Medicine, which are fully accredited (Animal Welfare Assurance numbers A3464-01 and A-3209-01). Every effort was made to minimize suffering. © 2017, Bucks et al.